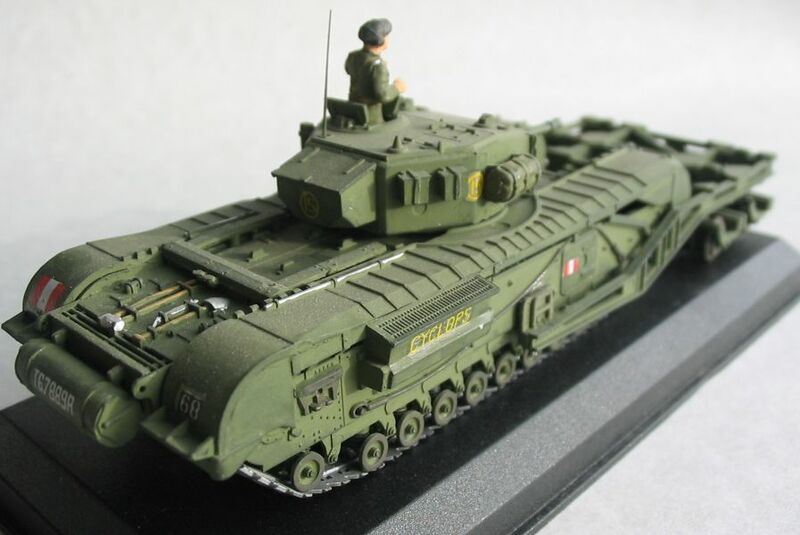 The model pictures below are a mix from the Churchill kits from Hasegawa, Esci/Italeri, Matchbox and Airfix. 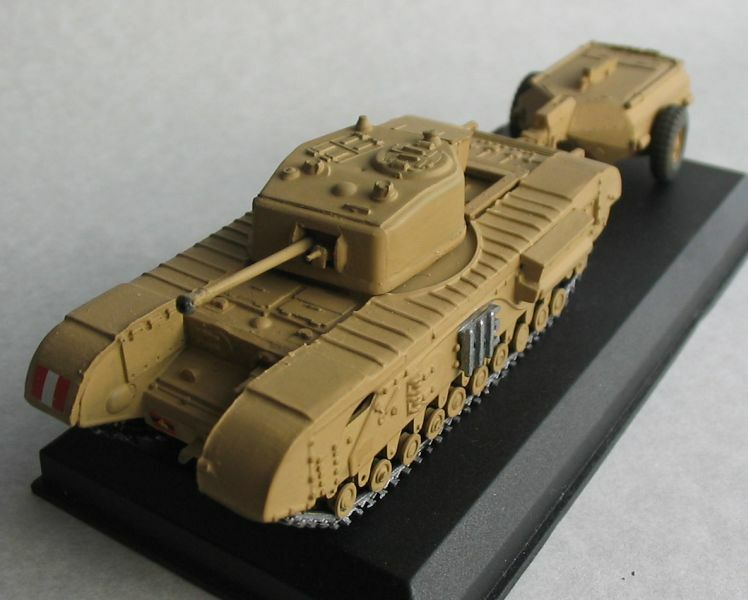 It was conceived as a 'shelled area tank'on the basis that the war would be fought in true WW1 style between the Maginot and Siegfried lines (Thy didn't expect us to get kicked out of Europe) and is the true forerunner of the A22 Churchill. 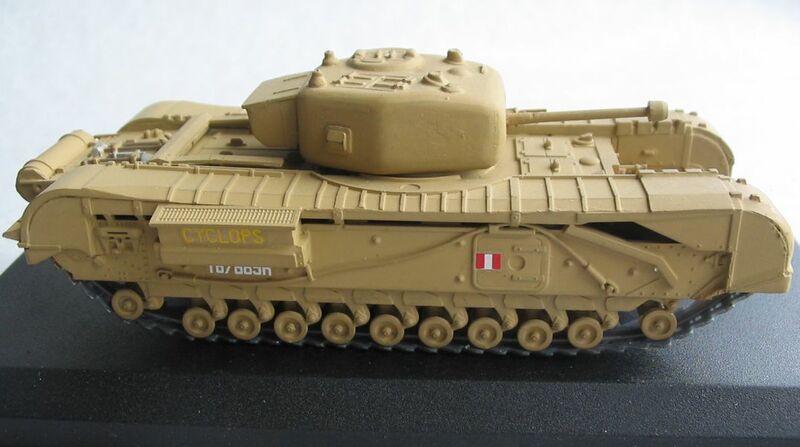 The original design had sponsons on the side (like a First World War tank) but these were later dropped in favour of the mg. ports you see in the photo. 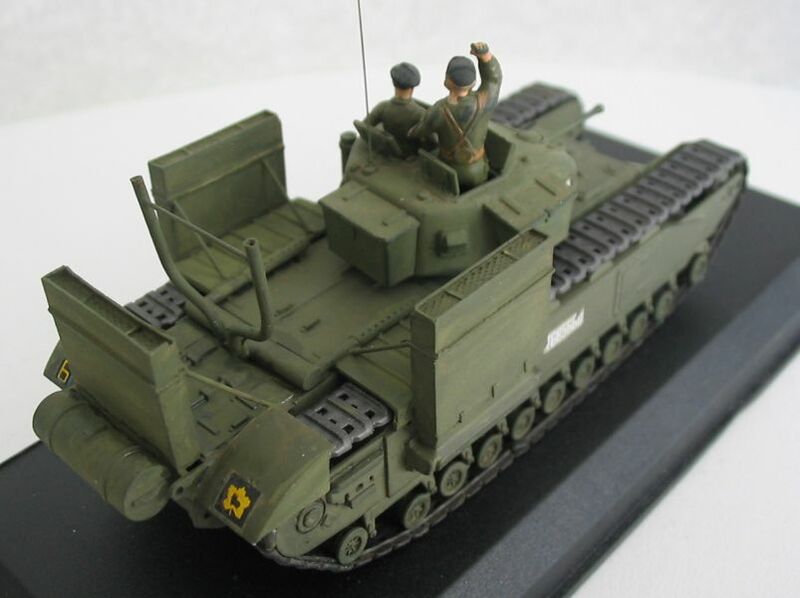 It was build by Harland and Wolf but it would seem that the Army people got fed up dealing with Belfast and eventually got Vauxhall involved - Vauxhall suggested some improvements / alternatives which obviously went down well as the A20 project was scrapped and Vauxhall then start on A22. 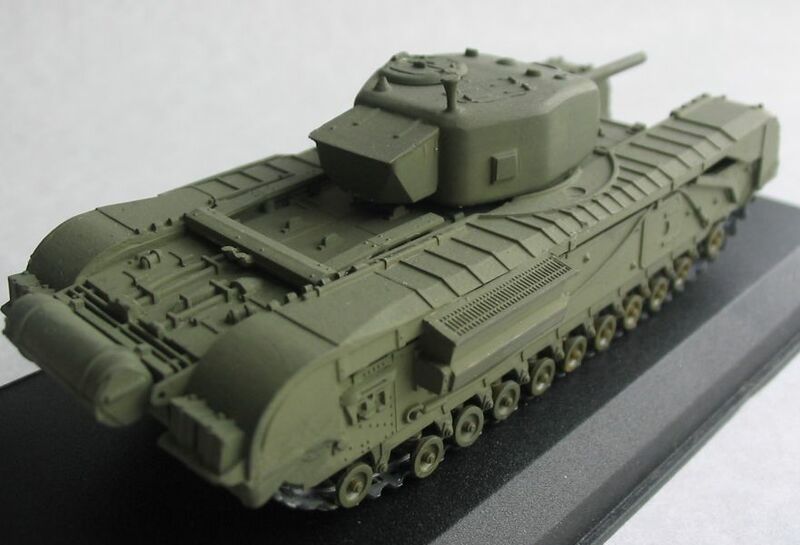 The A20 was designed with the turret from the Matilda tank with a 2pdr gun. 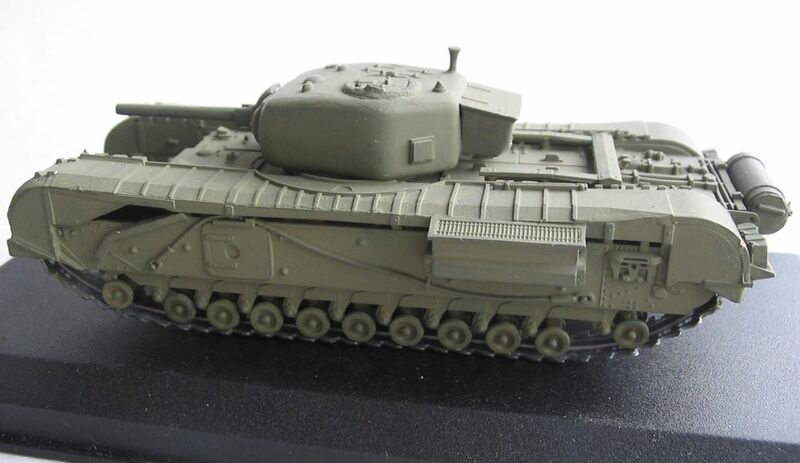 The other pics are from an early Churchill prototype that undergoing automotive trials. 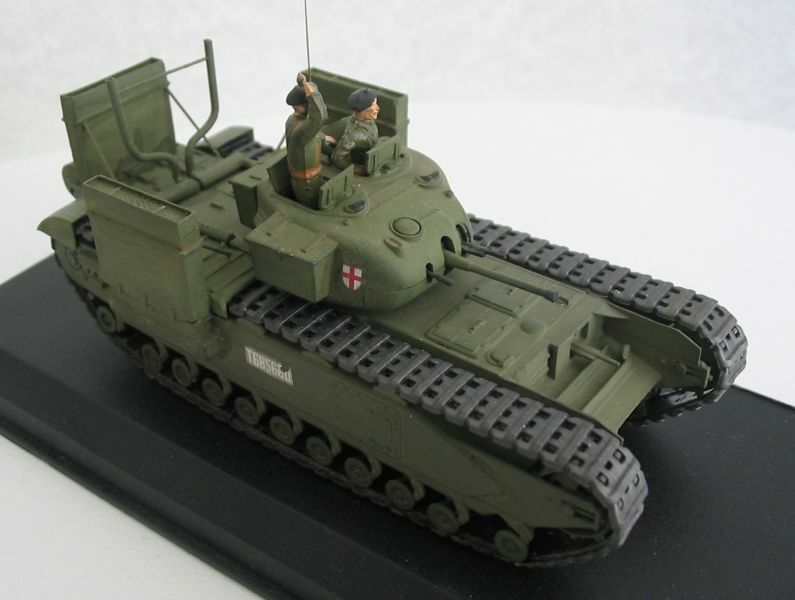 The A22 prototype was built by Vauxhall Motors Ltd. 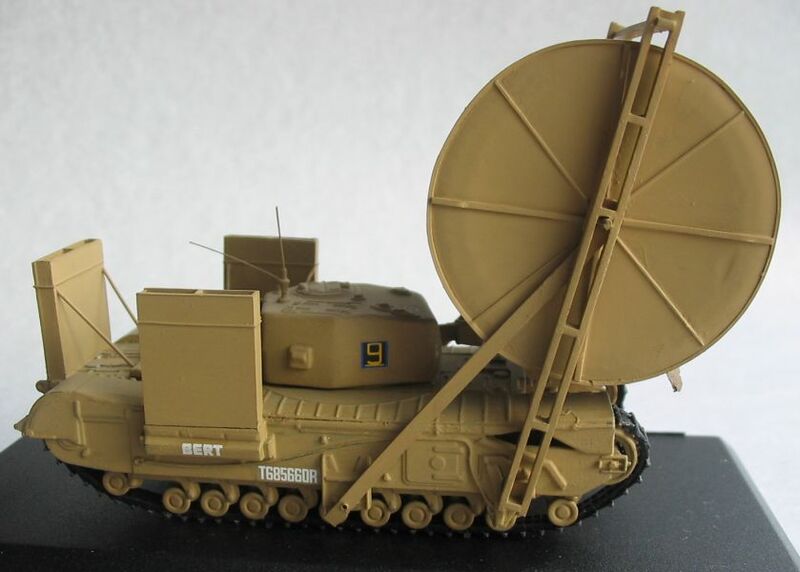 The showed vehicle had a wooden simulated turret. The hull is shorter than that of the A20 and the side air intakes are bigger. 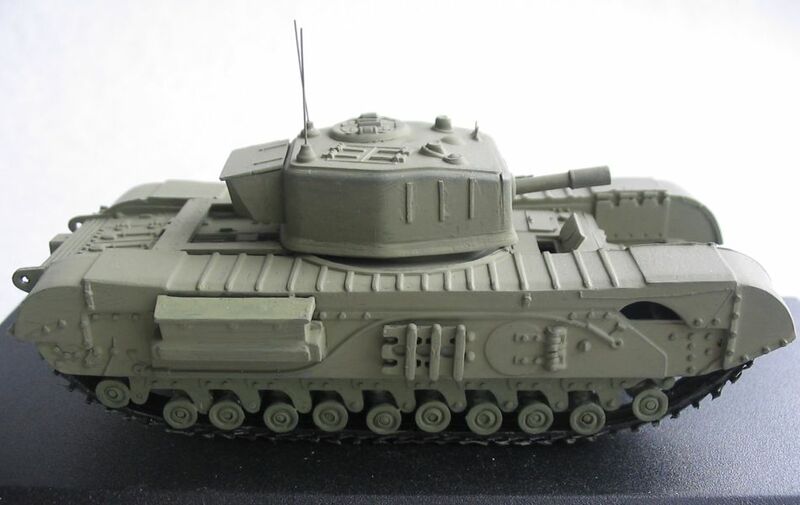 The turret was one of the last things to get right as originally it was designed for the 6-pdr but when they realised that there wouldn't be any they had to knock out a 2-pdr one - Makes you wonder why they didn't try the A20 trick of fitting the Matilda turret - perhaps the armour thickness wasn't up to spec. 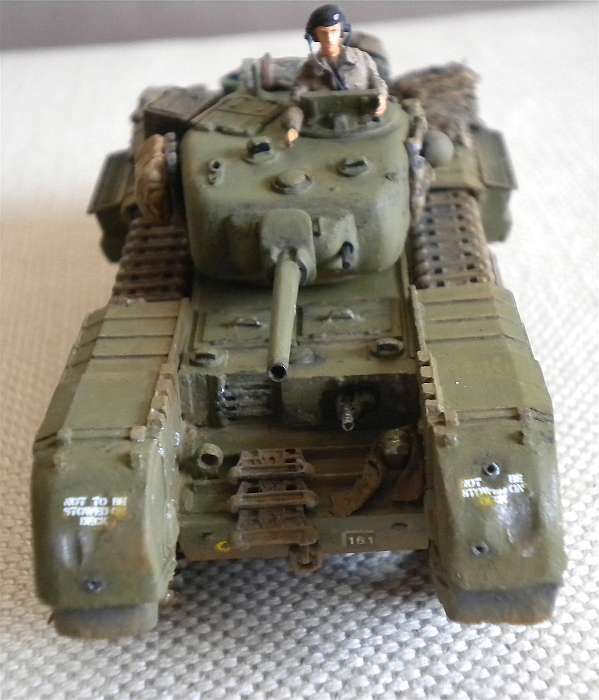 After a terrible defeat in France, the British Army, which was at that time still following the tactics used on the western front in World War I, commissioned Vauxhall to produce on trial the A22 Infantry tank. 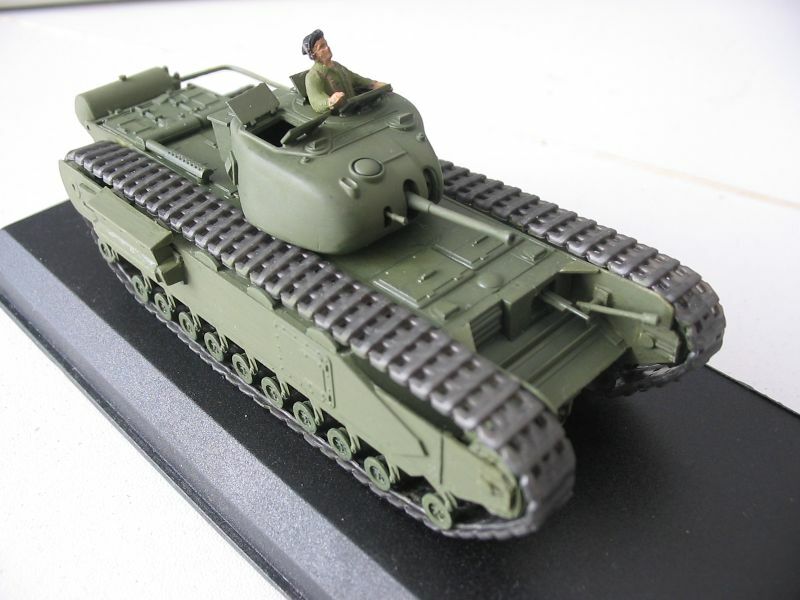 The A22 Infantry tank was a scaled-down type of the A20 and eventually, this Vauxhall tank became the Churchill heavy tank. 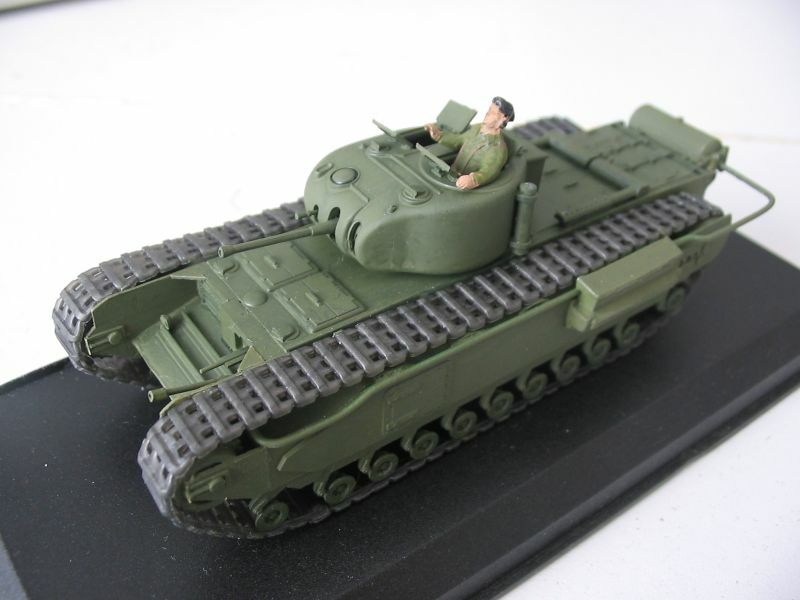 By the end of World War II, 5640 tanks, various models included, were produced by subsidiary companies of Vauxhall. 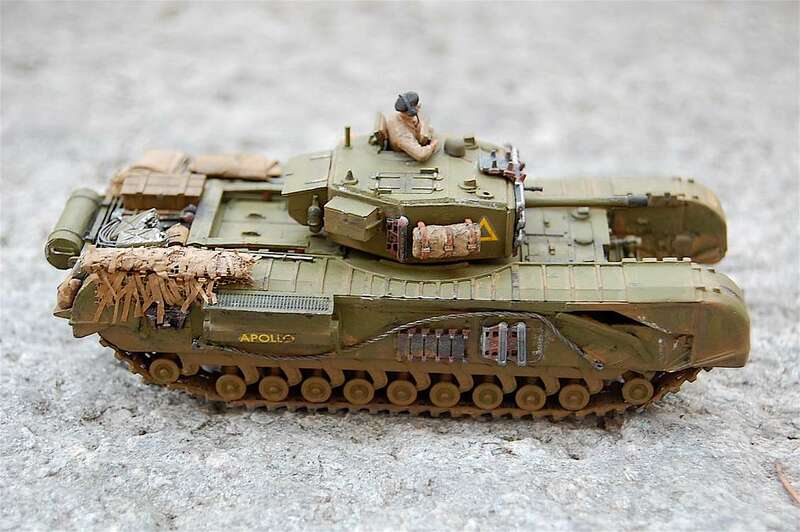 Beside the Churchill I - XI, the British Army built modifications of the Churchill such as flamethrower tanks called Crocodile, bridge-building tanks and mobile artilleries which carried a 3-inch gun. 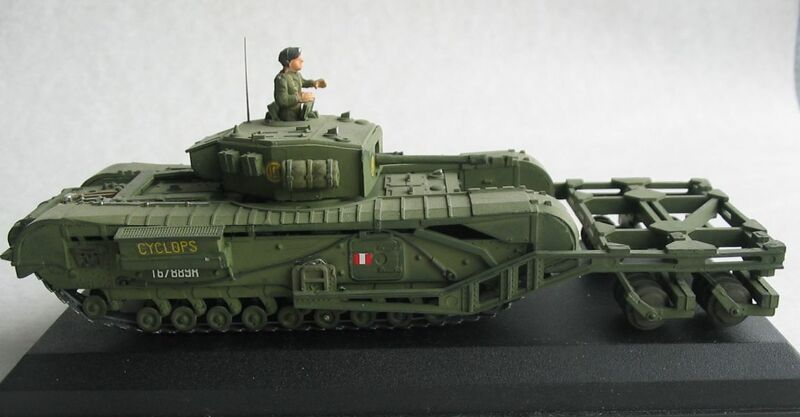 The Churchill first went into action in the landings in Dieppe on the Atlantic coast of France on August 19, 1942. 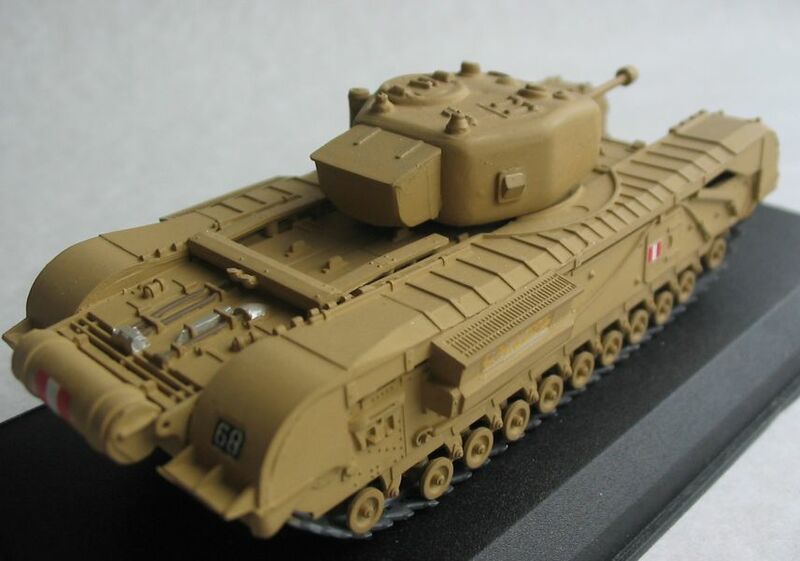 But owing to geographical disadvantages and tactical deficiency, the 2nd Canada Infantry Division, the Calgary Tank Regiment suffered heavy losses verging on annihilation. 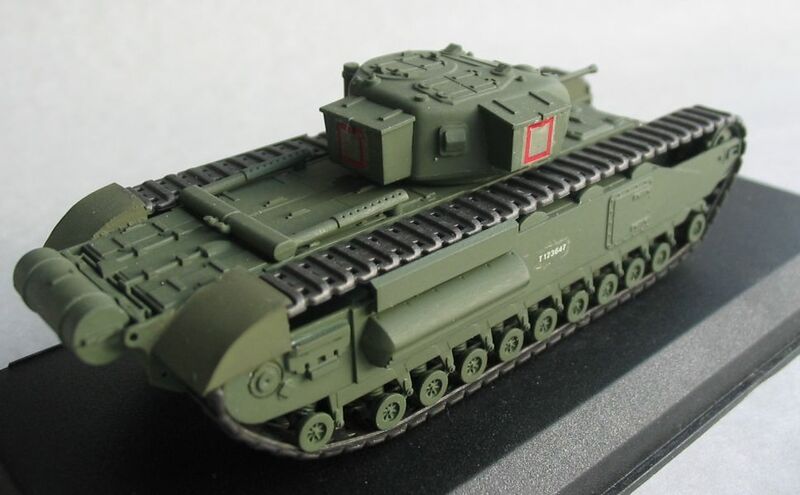 It was the Churchill MK-I and MK-III that fought in that fateful battle. 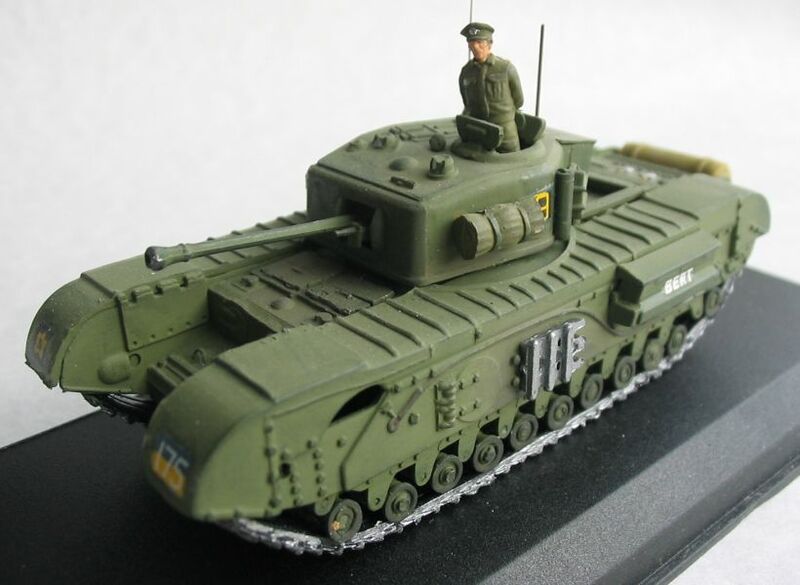 The Churchill MK-II was similar to the MK-I except that the 3 inch gun in the hull, which had a limited field of fire, was replaced by a Besa Machine gun (MG) A production change on all Churchills was the addition of guards inside the front horns to stop dust and mud obscuring the view of the driver and front gunner. Triangular support plates in the corners held the dustguards in place, and are visible here. 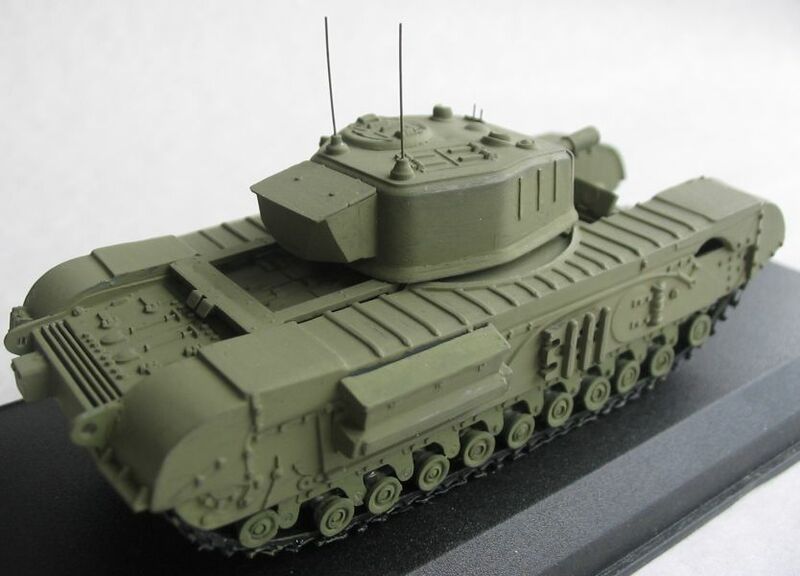 The Churchill MK-II CS (Close Support) was produced only in small numbers. 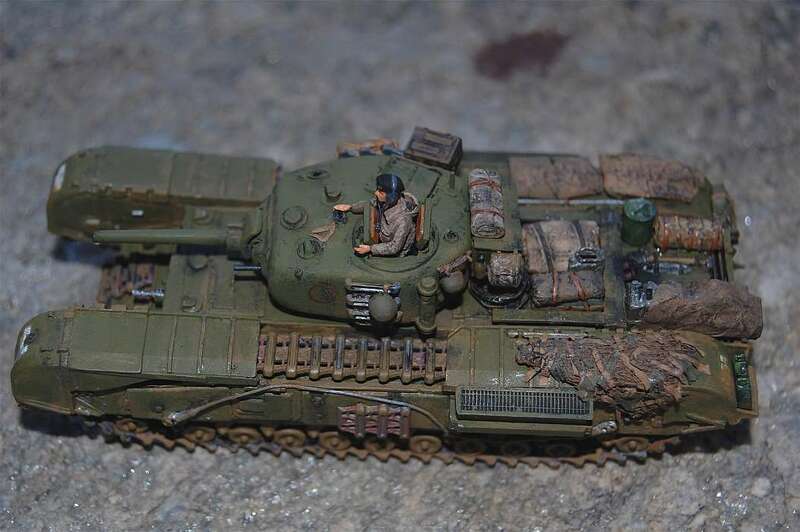 It had a 2 pounder in the front and a 3 inch howitzer in the turret - a remnant of pre-war policy where a few CS tanks were included in a regiment to provide smoke and HE fire. 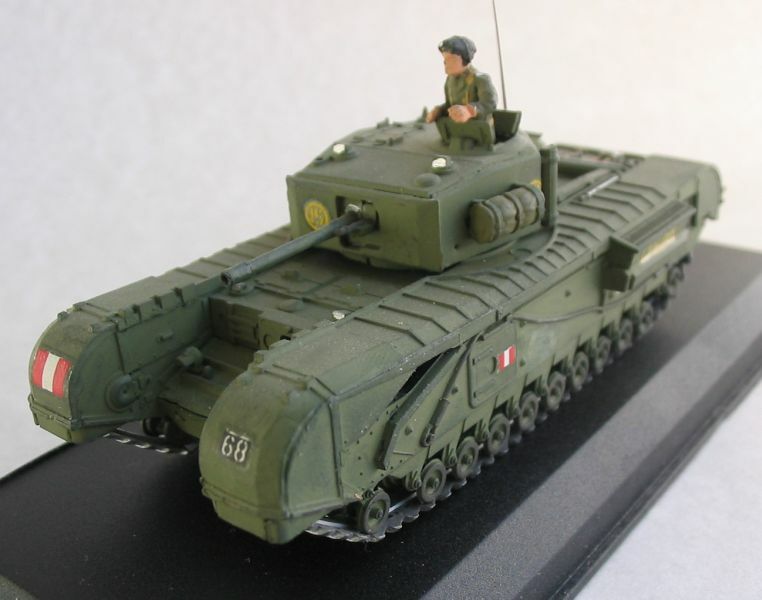 The Churchill MK-III was first used in action in the Dieppe landing of 19 August 1942. 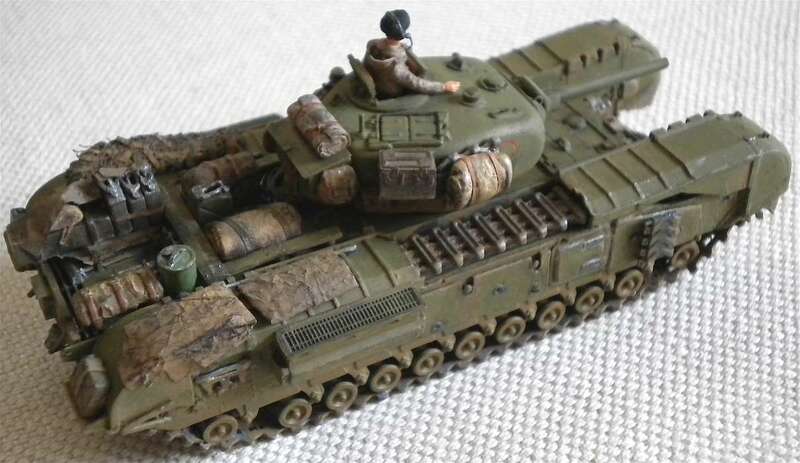 Some MK-I's were also used, and of 58 vehicles sent on the raid, 29 actually landed from LCT's. 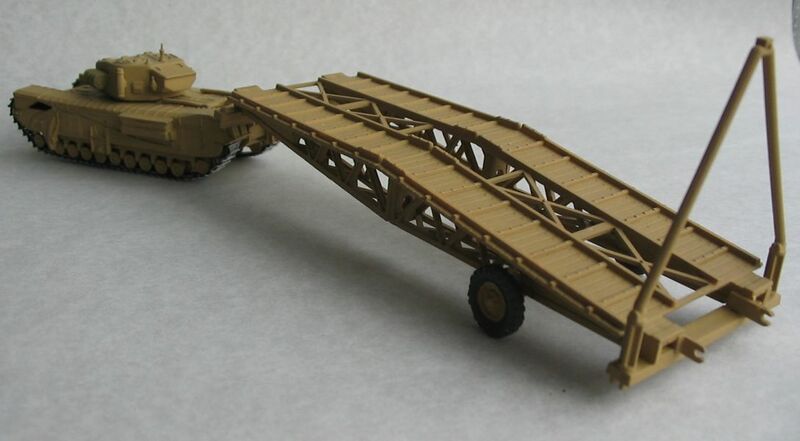 Three vehicles were fitted as flame-throwers (OKE), and leading vehicles carried primitive rolls of chestnut paling to lay a carpet on the shingle. 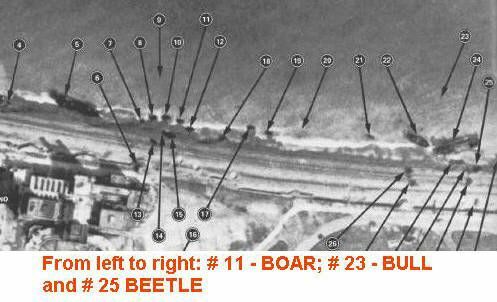 The use of tanks was abortive, however, and all were knocked out, most on the beach. 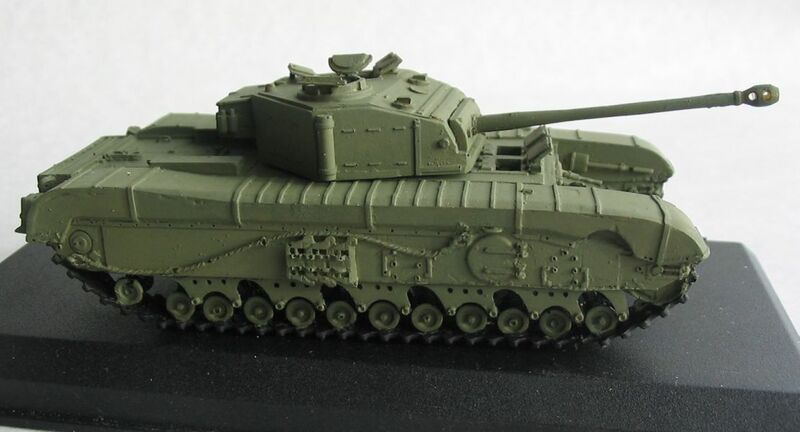 A cast turret was also produced for the 6 pounder gun, and vehicles so fitted were know as Churchill MK-IV's, but owing to limited manufacturing capacity, these variants were less numerous. 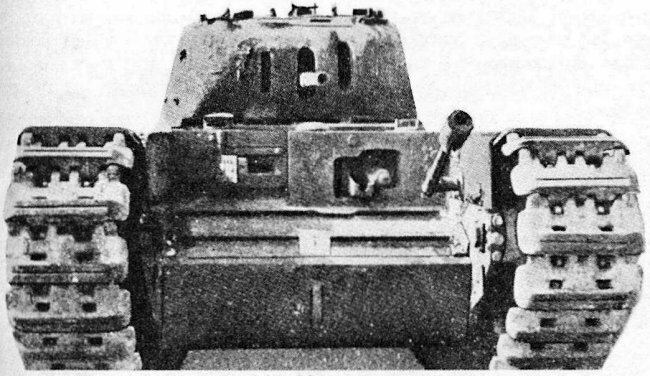 The cast turret was nominally better protected than the welded MK-III turret. 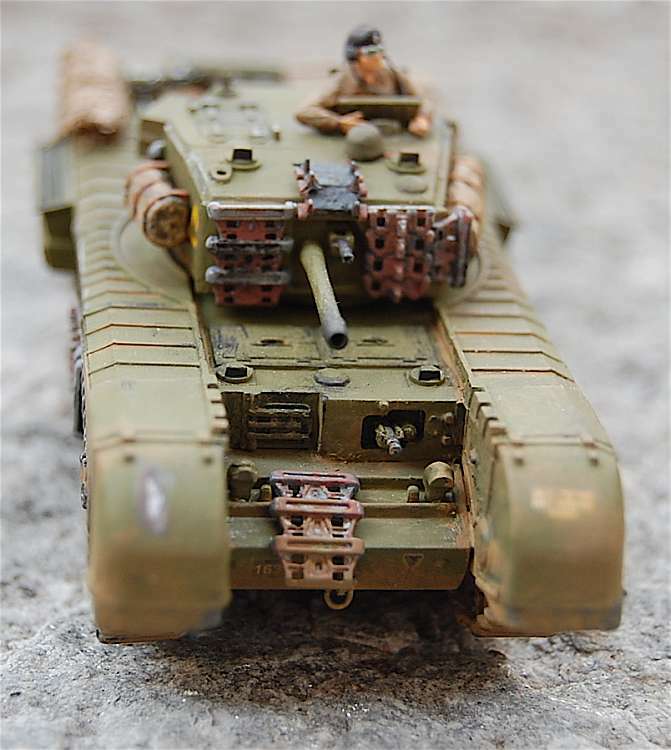 The British 2 pdr and 6 pdr tank guns fired only armourpiercing rounds. 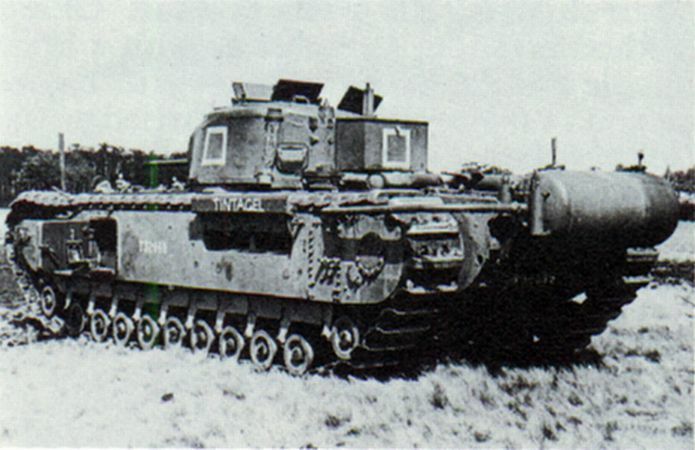 The American Grant and Sherman tanks entering British service in 1942 had 75mm guns, able to fire both armourpiercing and high-explosive rounds, thus enabling them to engage both "soft" and "hard" targets and eliminating the need for separate close-support tanks; in addition, German tanks now had 75mm guns and there was obviously an urgent need for 75mm guns fitted to British tanks. 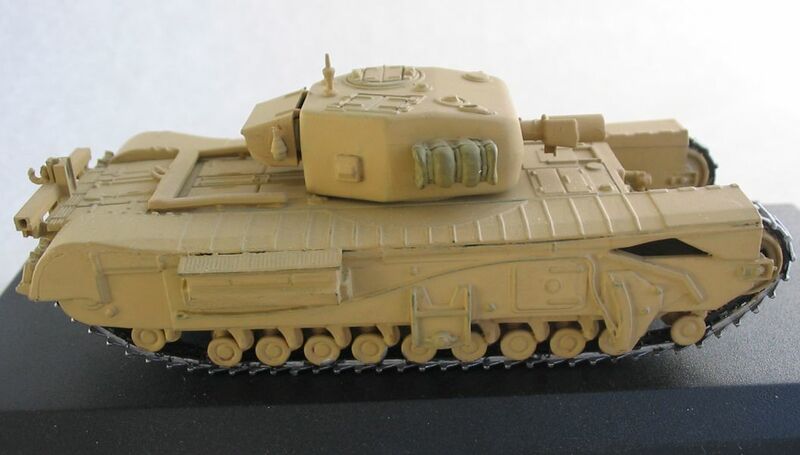 The first fitting was a field modification in Tunisia by the 21st Tank Brigade, whose workshops took American M3 75mm guns and mantlets from wrecked Sherman tanks and mounted them in 120 Churchill MK-IV's. 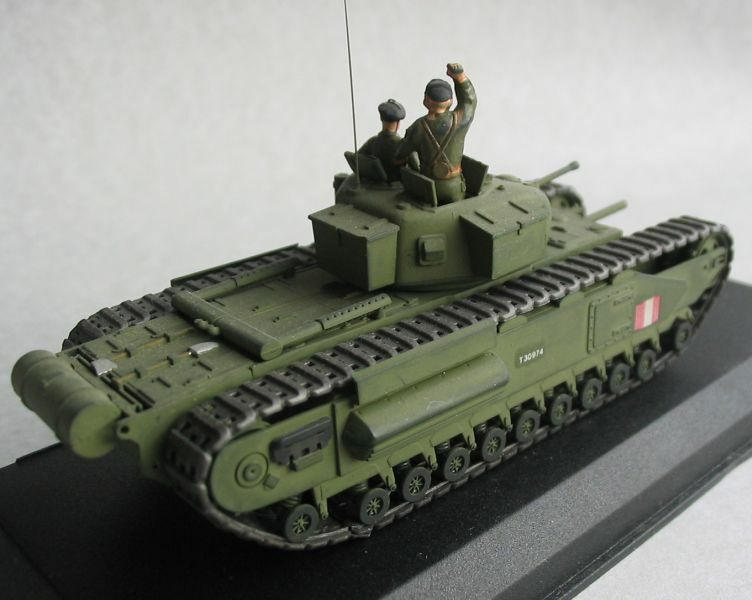 This type was called Churchill MK-IV (NA 75). 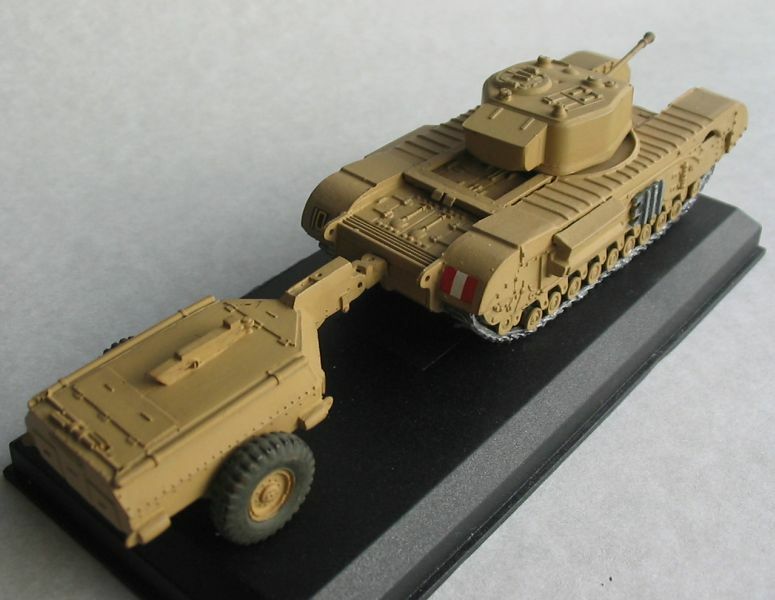 With a capacity for 75 rounds, it was a successful conversion, and the type was used in Italy until the end of the war. 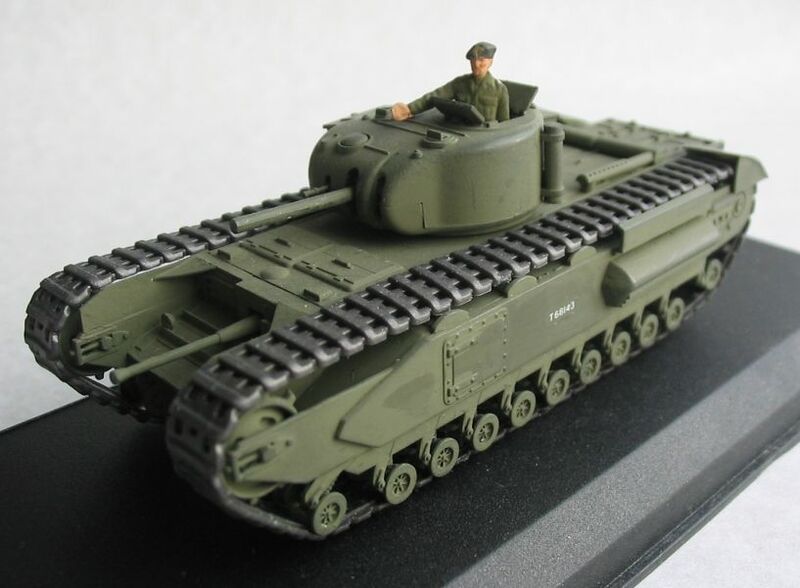 The Churchill MK-V was a new close-support tank produced in 1943, intended to replace the remaining MK-I's, which had been retained for close-support purposes by virtue of their 3 inch howitzer armament. 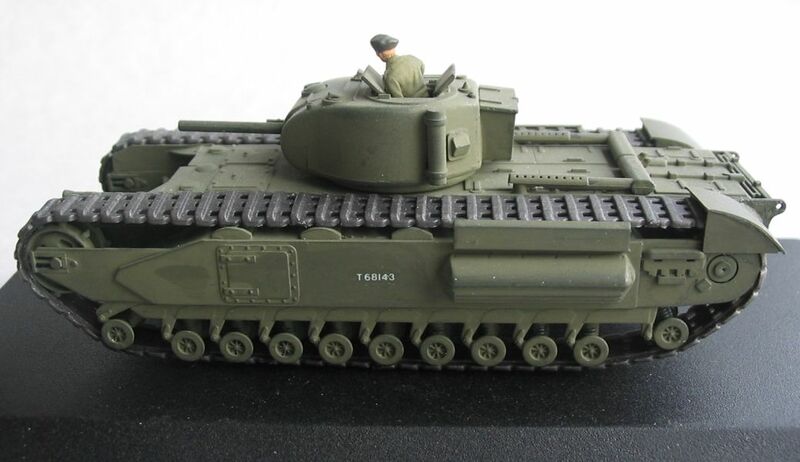 The Churchill MK-V had a 95 mm tank howitzer, It was build in small numbers. 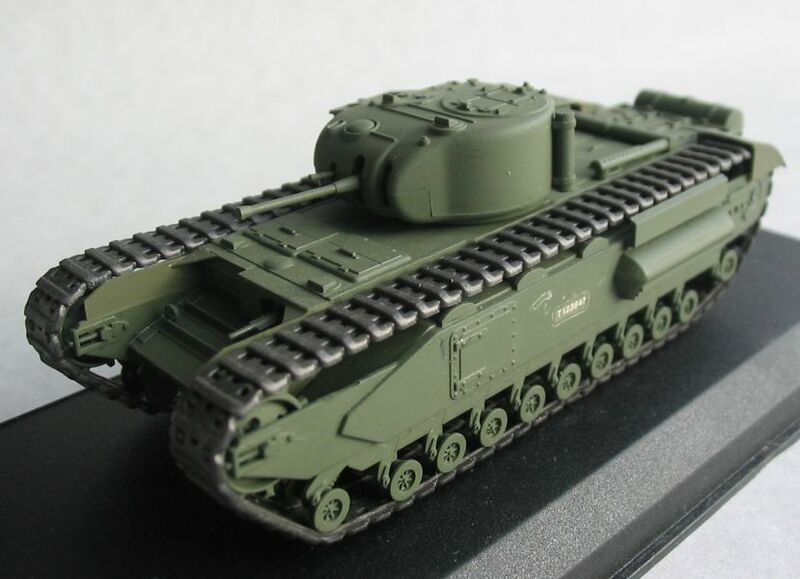 The Churchill MK-VII was a great improvement, but the redesign increased the weight of the tank to 40 tons and reduced its top speed to 13mph. 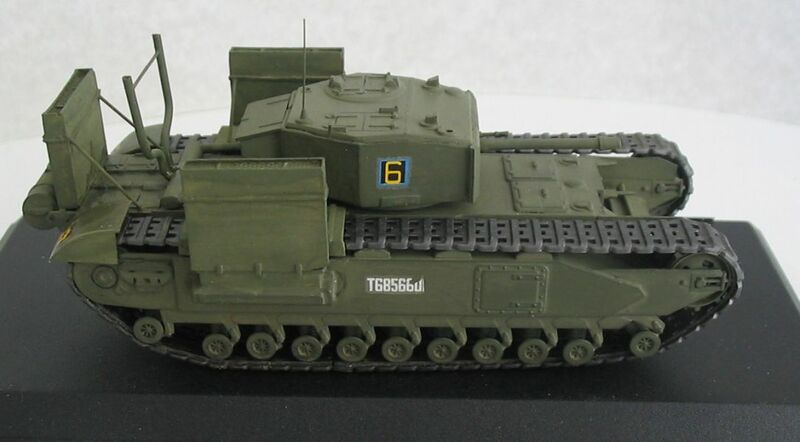 In service the MK-VII was soon encumbered with gear and, like the earlier marks, had parts of the track covers removed. 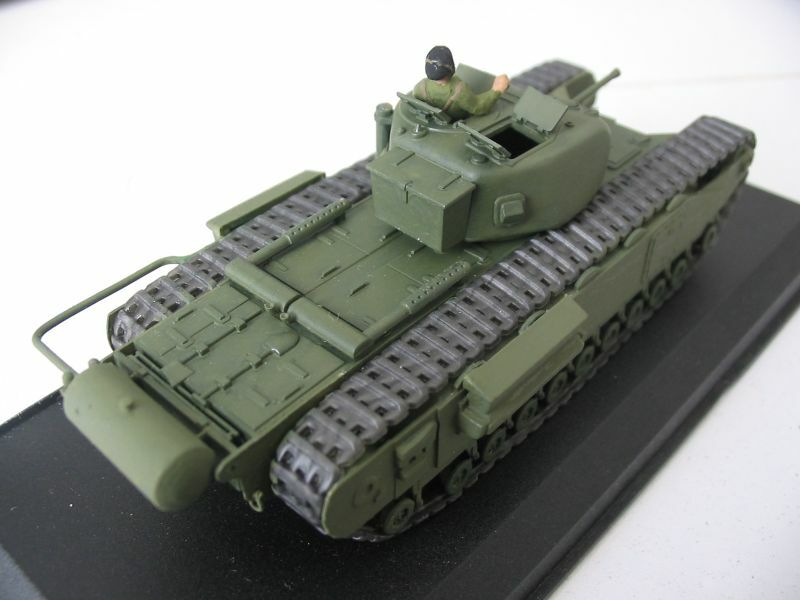 The Churchill MK-VII was available just in time to participate in the Normandy campaign. The spare track shoes, giving extra protection, and missing track guard centre section. 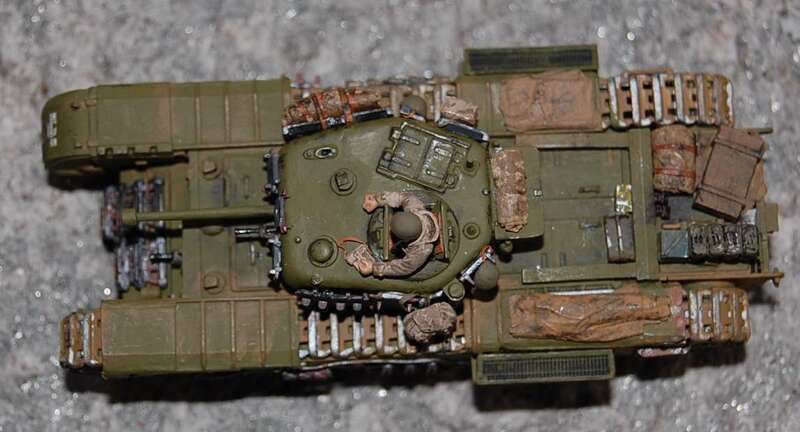 The 75mm gun and circular escape doors identify the vehicles as a MK-VII. 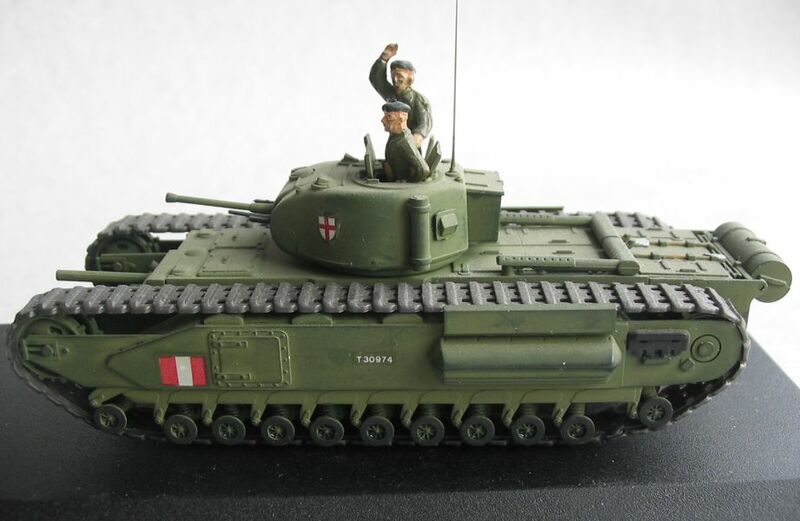 The Churchill OKE was a early form of flamethrowing tank developed in 1942. 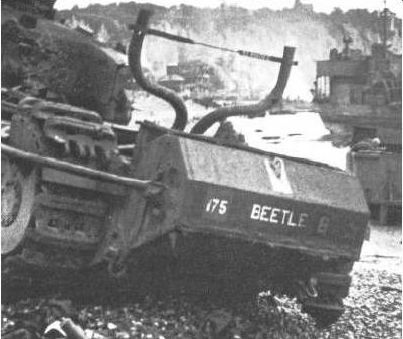 Three Oke's went on Dieppe raid in August 1942 but all were destroyed before they could use their flame projectors. 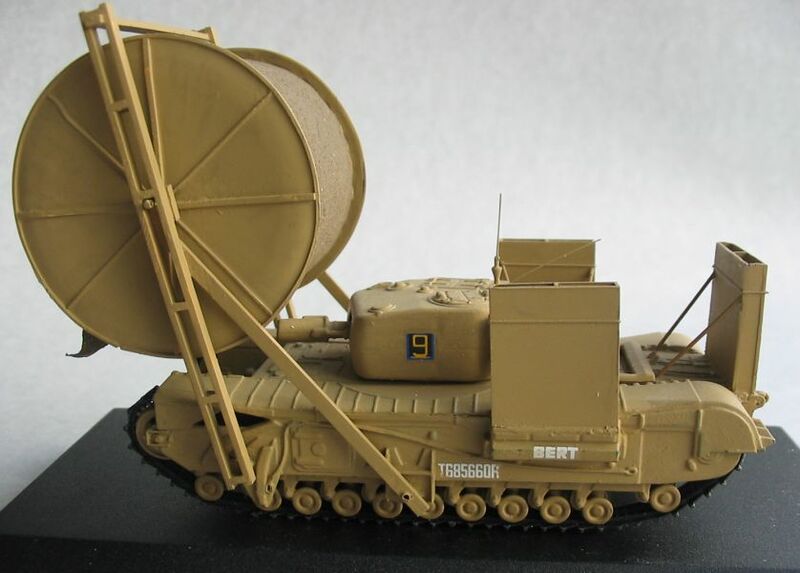 The OKE flamethrowing tank was named after its designer, Major J.M. OKE, who has submitted his ideas towards the end of 1941. 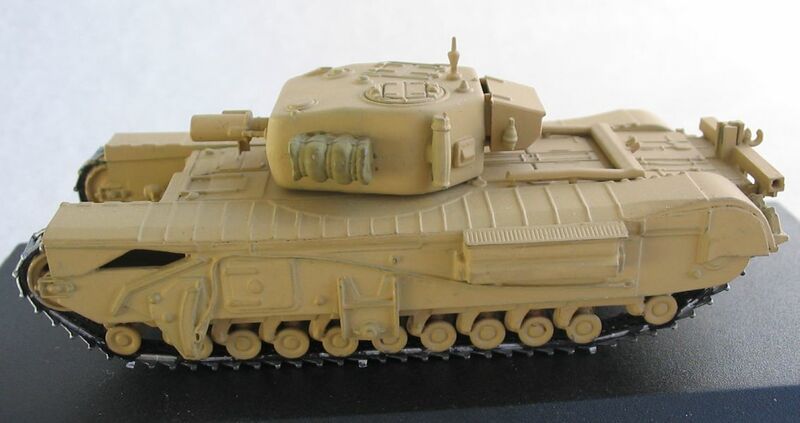 The design was basically for a Churchill tank fitted with the Ronson flamethrowing equipment, which had already been fitted successfully to carriers. 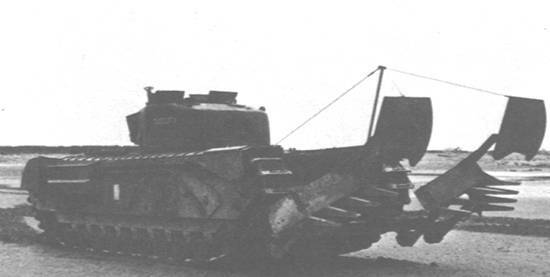 A cilindrical tank containing the flame fuel was fitted at the rear, with a pipe from it leading along the left hand site of the hull, passing under the tracks by the air intake, and emerging between the front horns. 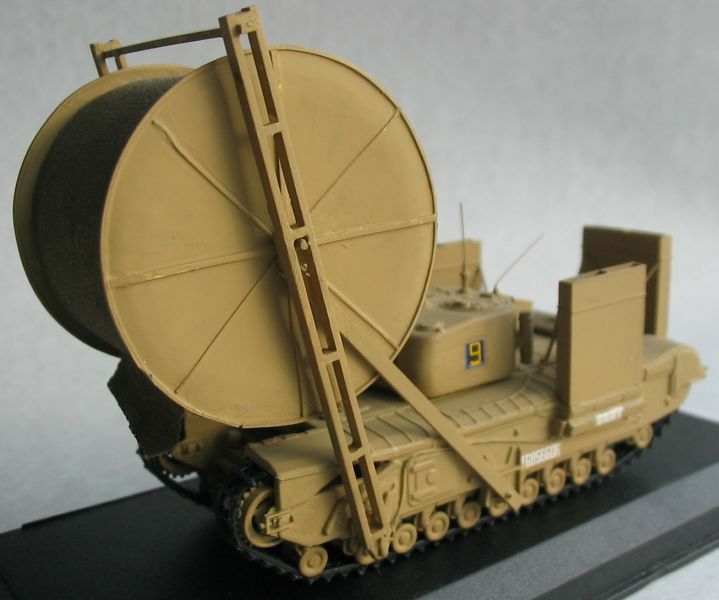 There it was connected to a Ronson flame projector mounted in fixed elevation. 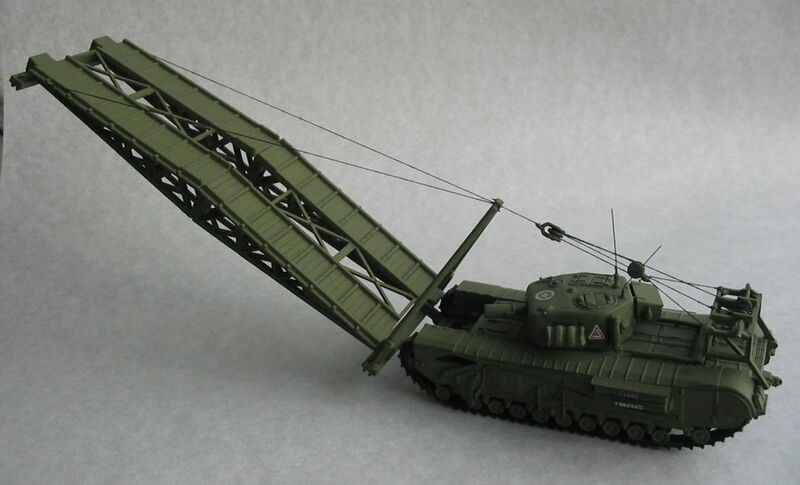 This design satisfied the General Staff specification that flame throwers should be mounted only on Infantry Tanks, and that theyshould be capable of installation in unmodified production tanks. 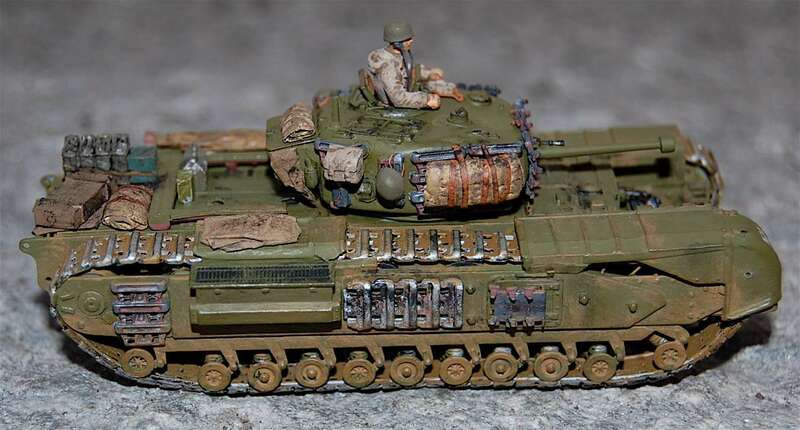 The flamethrower's range was 40 or 60 yards. 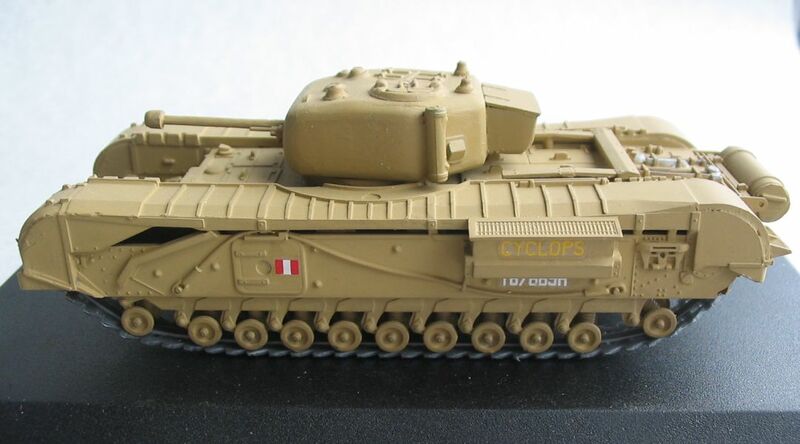 The rear fuel tank was originally unarmoured, but by the time of the Dieppe raid it had been covered by a large armoured box. 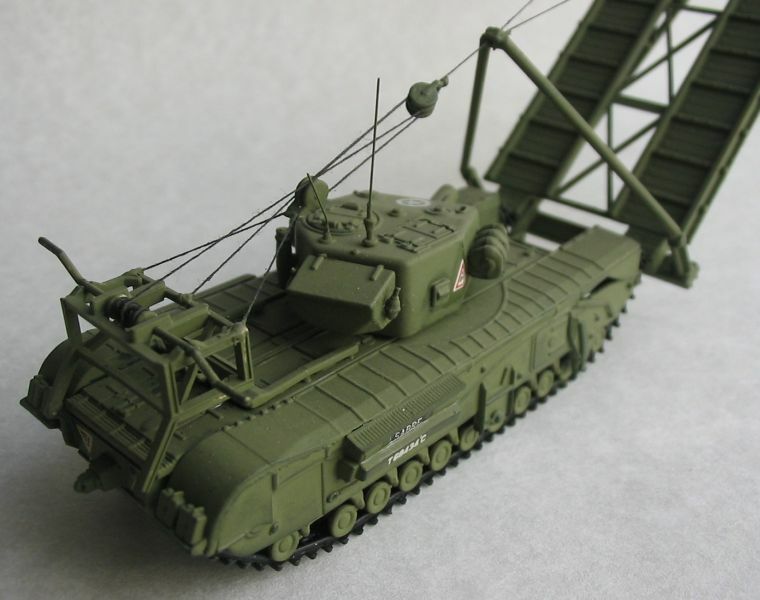 Both Peter Chamberlain, in an article in Airfix Magazine in September 1967, and John Reed, in the same magazine in October 1981, state that the equipment was jettisonable. 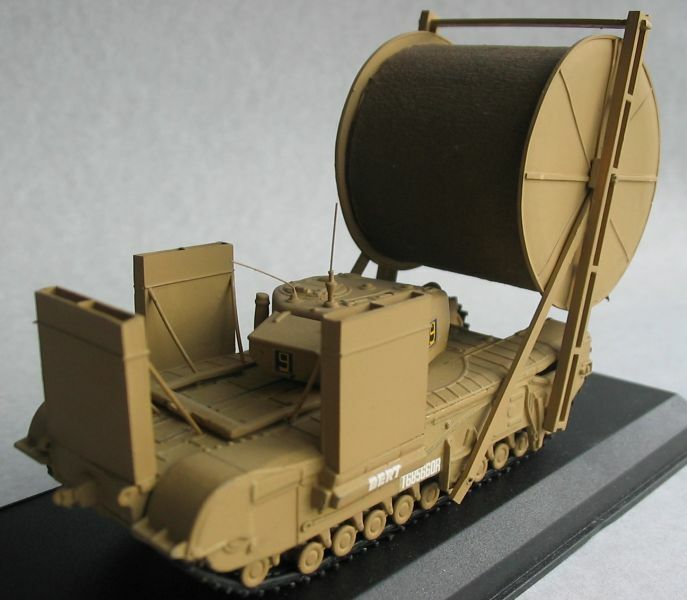 While this may have been so in the OKE's original form, the addition of an armoured box would seem to make jettison impossible. 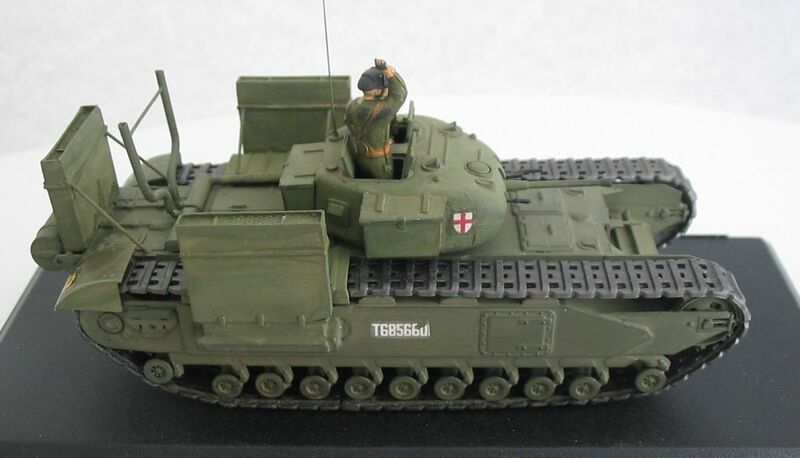 Three Churchills were converted by Lagonda Ltd. to take the OKEequipment: T32049, T68875, and T31862. 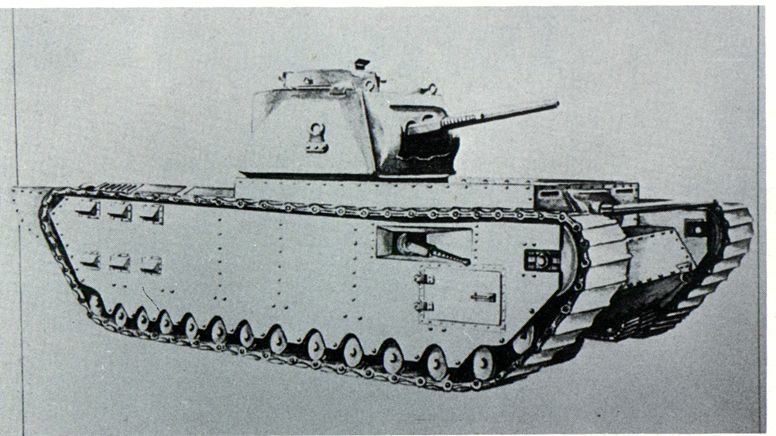 The first two were MK-II's built by Newton Chambers and Beyer Peacock respectively. The T31862 was a MK-III built by Birmingham Railway Carriage Company. 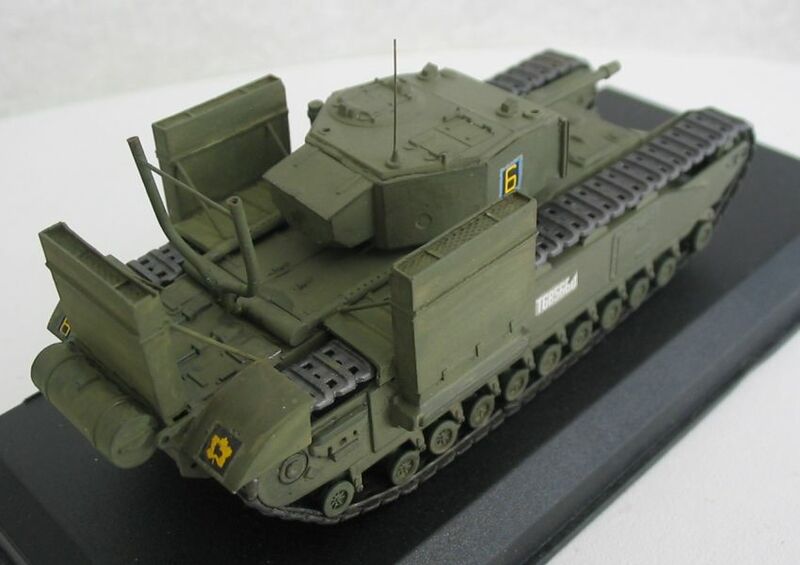 (This does not tally with books dealing with the OKE, which say that all were MK-II's.) 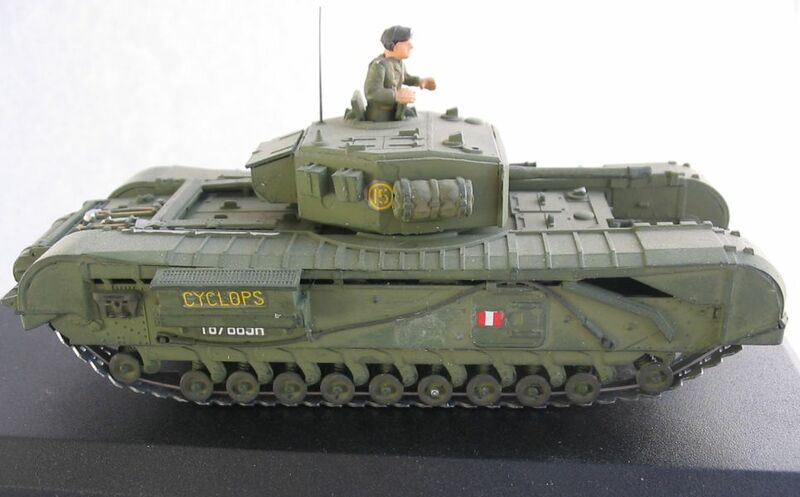 The three OKE's comprised 8 Troop of 14 Canadian Army Tank at Dieppe; all were lost in the operation. One OKE sank in deep water after leaving it's landing craft prematurely, and another damaged its fuel tank, having made a very heavy landing. 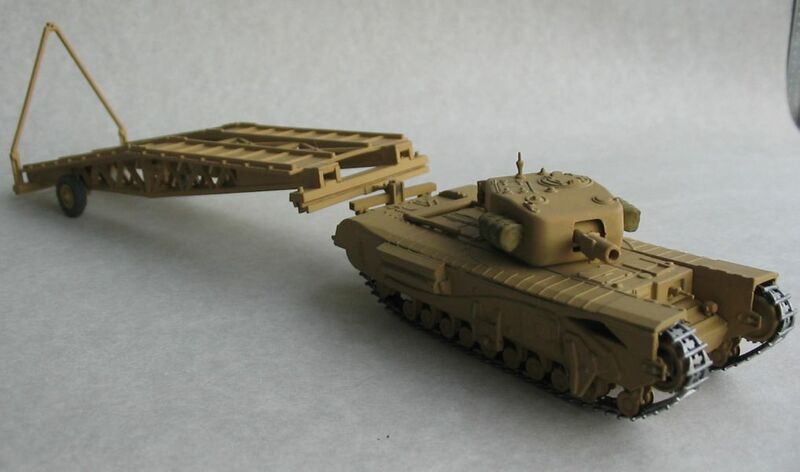 It is extremely doubtfull wheter the third tank came within sufficient range of German positions tu uese its flamethroer. There is no evidence that any further OKE's were built. 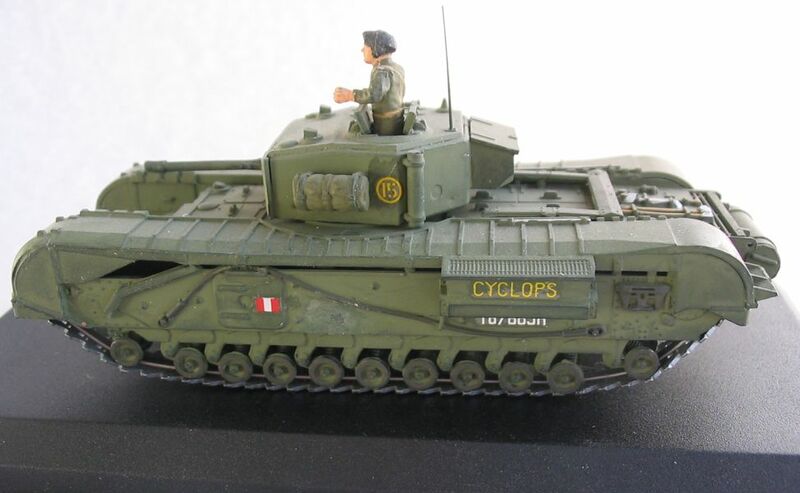 For information about the landing in Dieppe August 1942, visit next site. 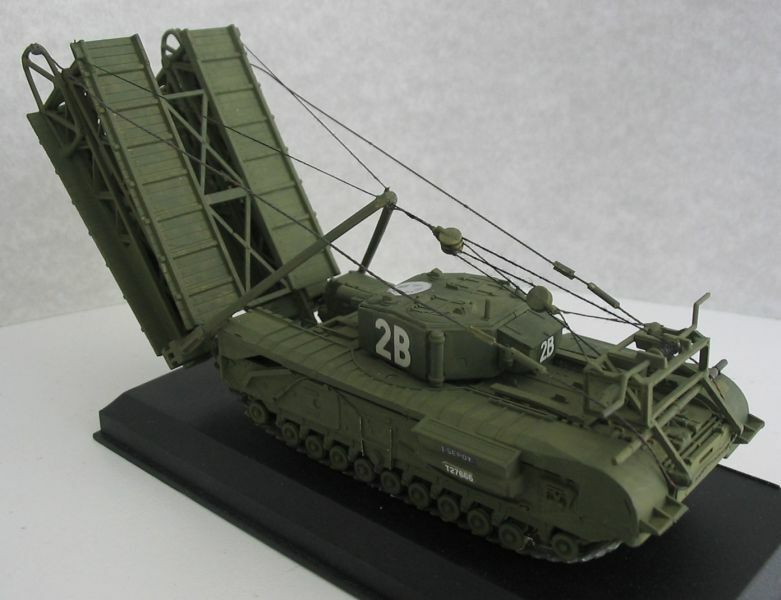 With pictures and information about the landing & vehicles. 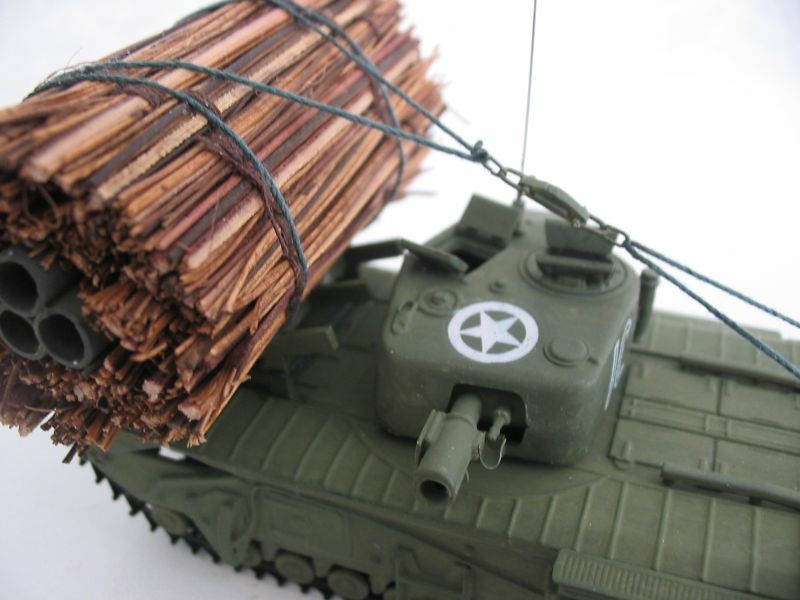 Through a Lens: "Dieppe in Photographs and Film"
"Library and Archives Canada - www.collectionscanada.gc.ca - Part 1 Pictures"
"Library and Archives Canada - www.collectionscanada.gc.ca - Part 2 movies"
A close-up view of the Petard mortar on an AVRE. 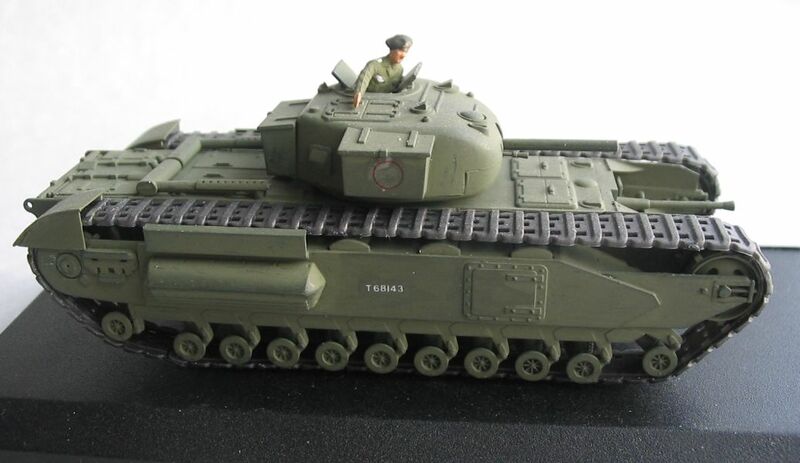 It was attached to the original 6pdr mantlet of the Churchill IV and the breech opened by tilting the barrel vertically, loading being effected from the sliding front hatch in the hull. The co-driver acted as loader. 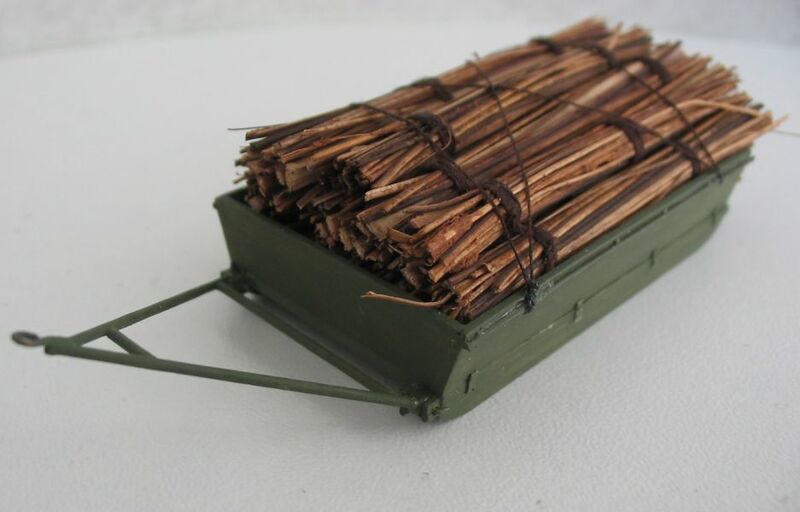 The "Flying Dustbin" projectile that was fired by the 29cm Petard Mortar. 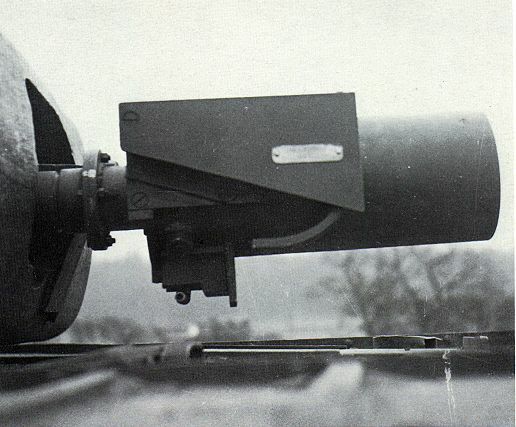 It weighed 40lb, could be fired at the rate of 2-3 rounds per minute, and had a effective range of 80yds. 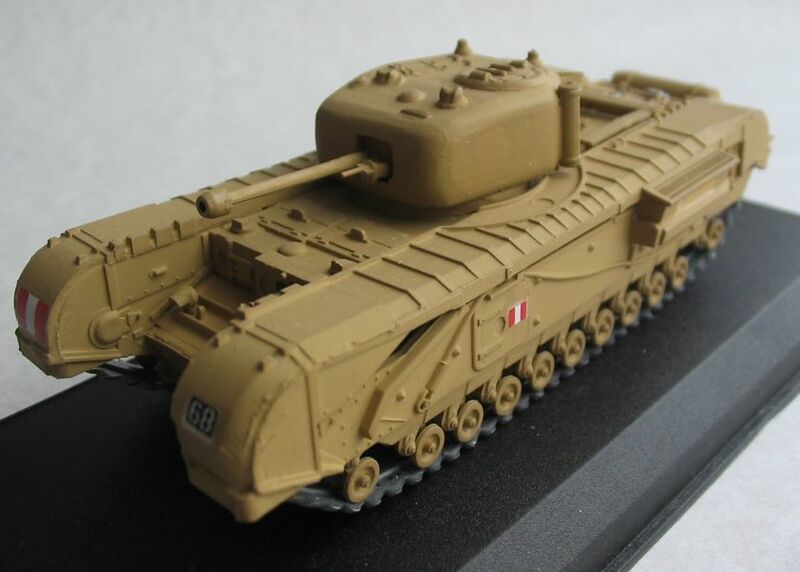 The experience of the abortive Dieppe raid in August 1942 showed that specialised armoured vehicles would be invaluable for landings over defended beaches, to assist in overcoming obstacles, climbing sea walls, placing demolition charges, etc. 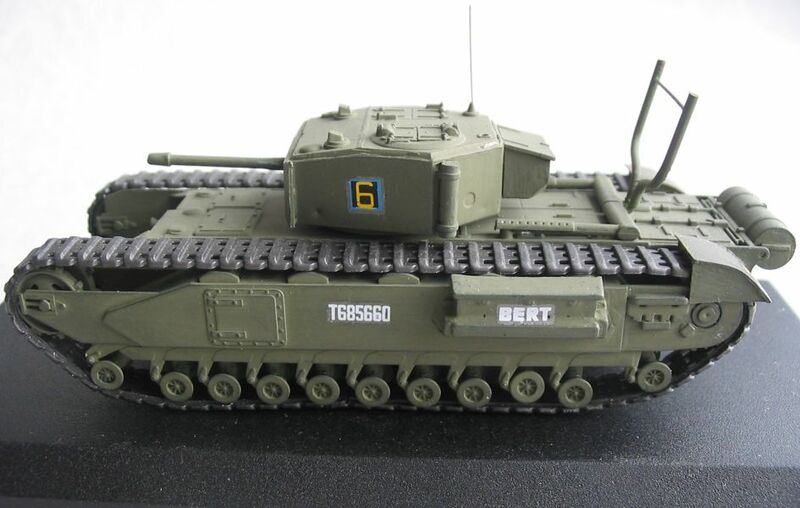 This led to the formation of the 79th Armoured Division, charged with developing suitable vehicles. 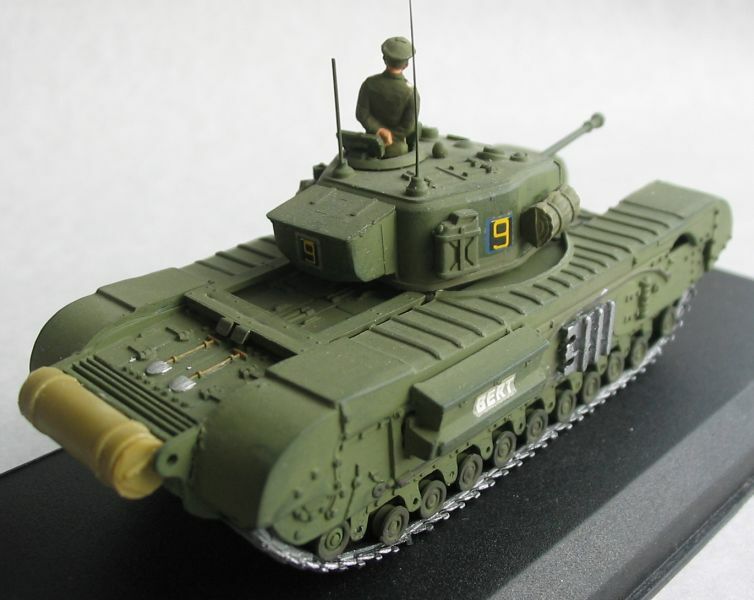 One of the most important types produced was the Armoured Vehicle Royal Engineers (AVRE), and the Churchill tank proved to the best type for the job. 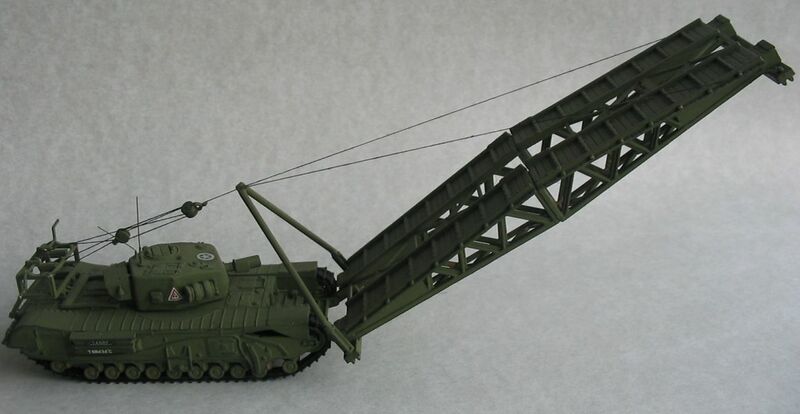 The short Petard mortar, in welded MK-III or cast MK-IV turrets, instead of a gun was its most distinctive feature, but it also had bolt positions on the side to which could be anchored a dozer blade and other attachments. 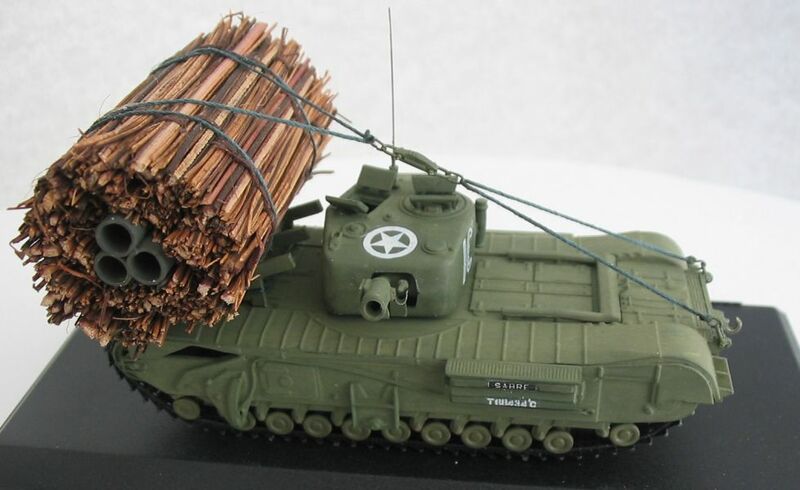 The AVRE could also carry a fascine (Bundle of wood) on the nose to fill craters and anti-tank ditches. 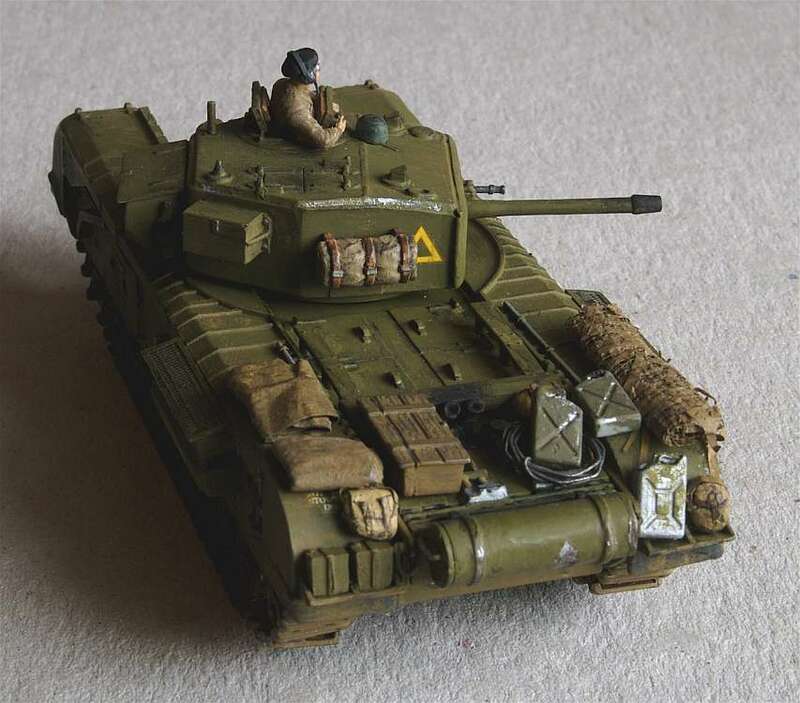 A wooden cradle supported the fascine, hawsers held the fascine in place until release was required, and slip line allowed release to be carried out remotely from under cover in the turret. 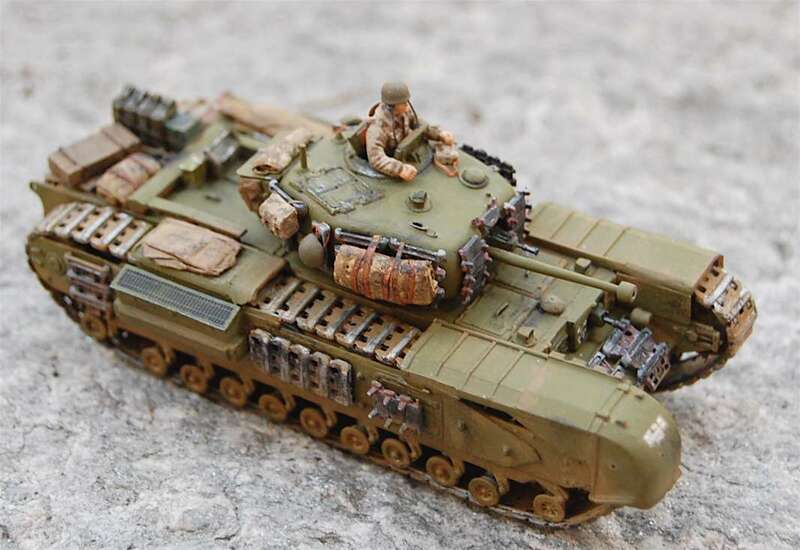 As the commander's view was obscured by the fascine, he often commanded the vehicle from atop the fascine. 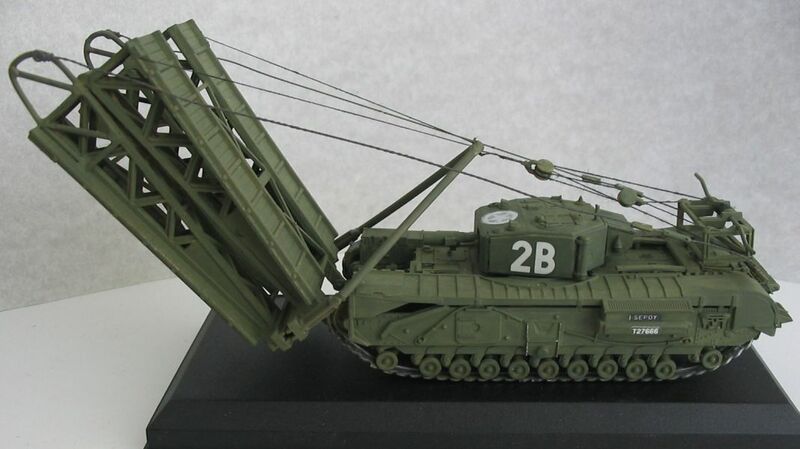 This model tows behind it a sledge carrying for extra fascines. Most production A.V.R.E. 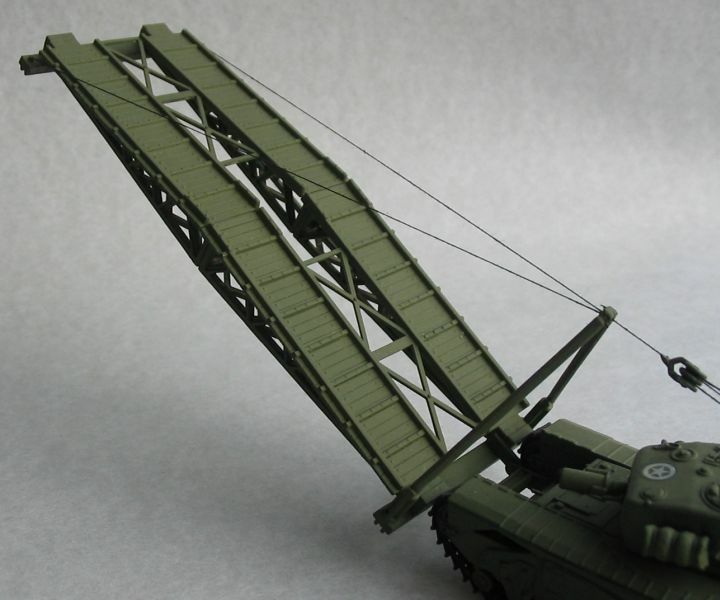 's were fitted with brackets on the hull for the attachment of fittings for special tasks. One of these fittings was the carpet layer device for crossing soft patches on beaches, for example. The carpet -the most common form was hessian matting reinforced with steel tubes- was carried on a large bobbin at the front of the A.V.R.E. and was unwound by the vehicle itself running over it. 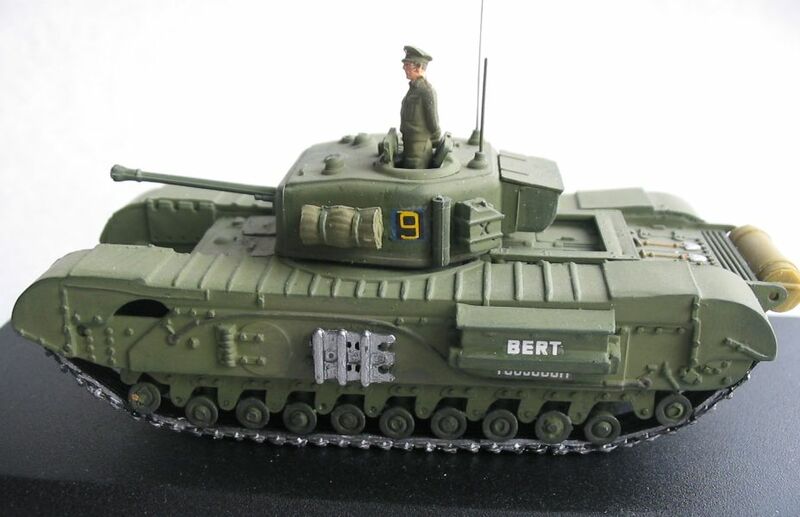 A number of these were employed on the D-Day landing beaches. 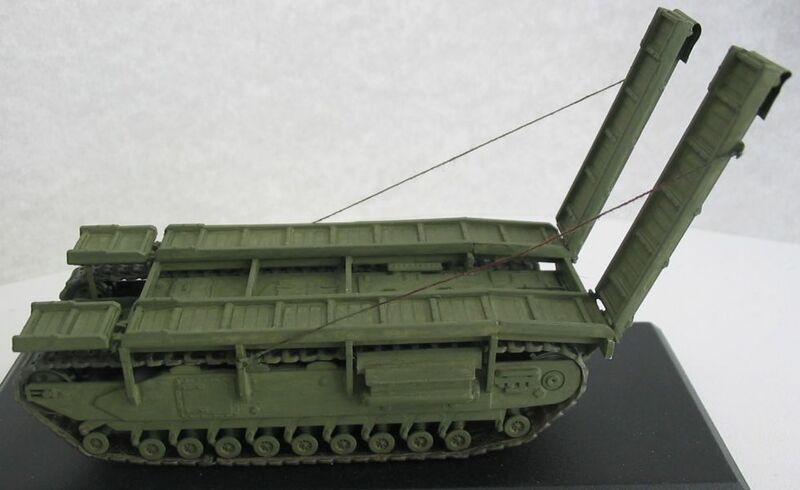 There were several versions, and the carpet layer Type D (waterproofed for landing from a landing craft) is shown. 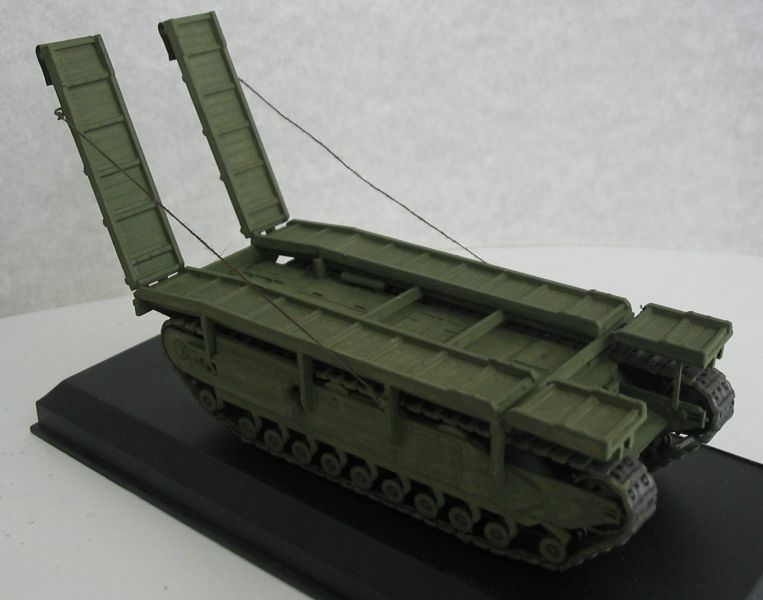 The anti-mine reconnaissance castor roller. 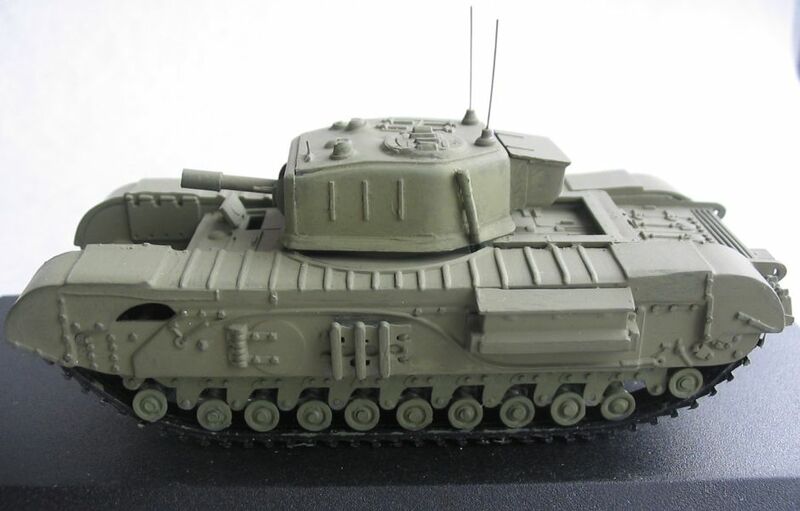 Fitted on Churchills and Shermans. 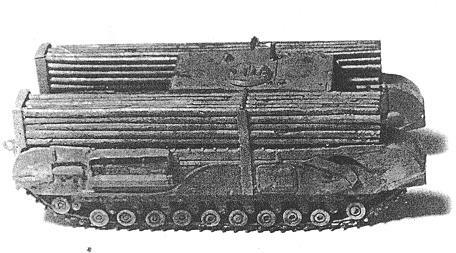 Rollers were carried in a frame in front of the tank and exploded the mine by pressure. 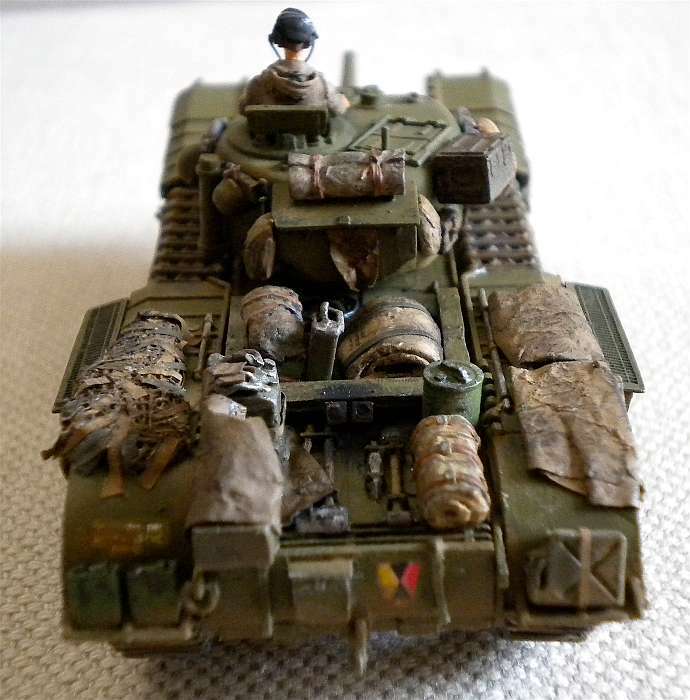 It never reached operational service. 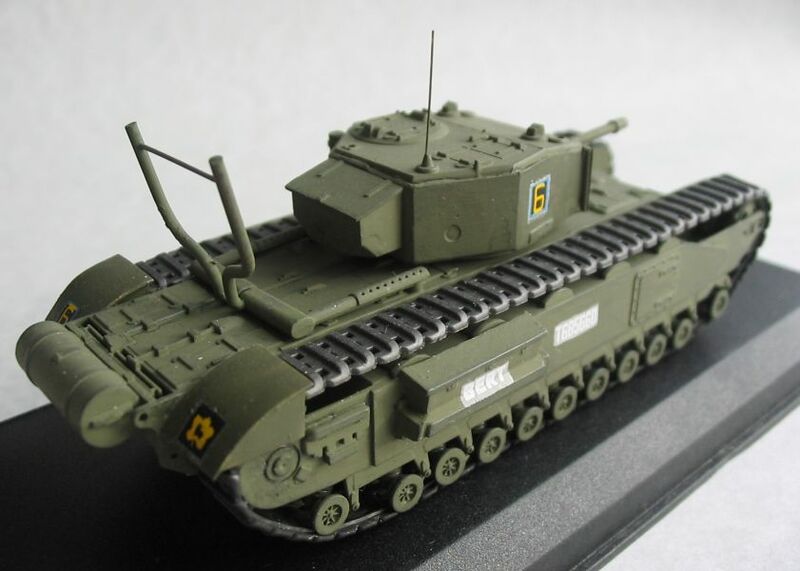 The Assault Vehicle, Royal Engineers, or AVRE as it was usually called, was adjudged successful after trials and modifications to the original design which took place in 1943, and production was ordered. 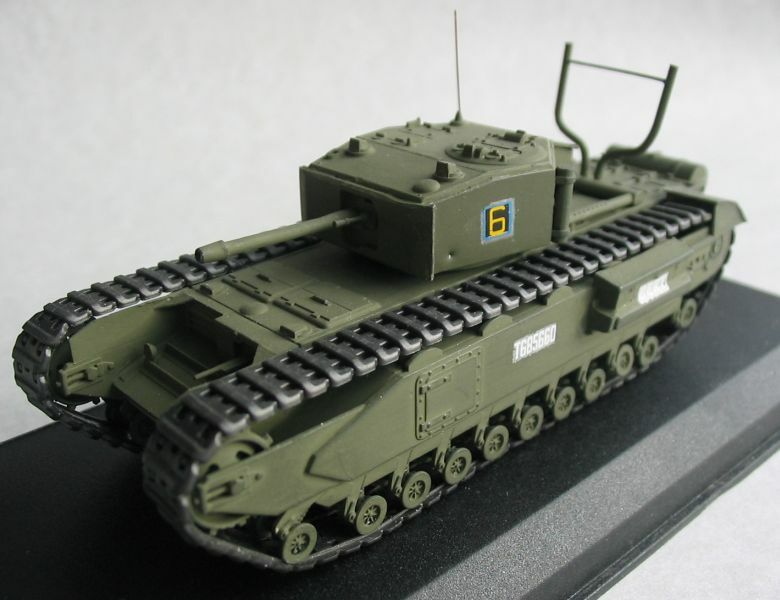 The Churchill MK-III or MK-IV was used as the basis, and a total of about 700 AVRE's was built by 1945. 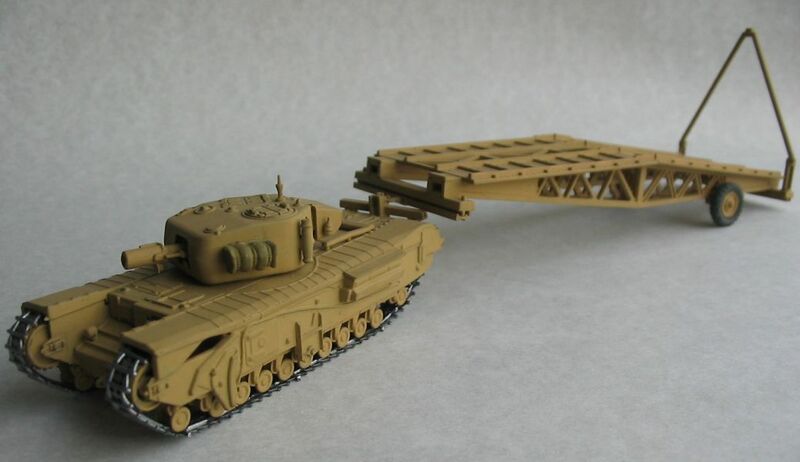 An important use of the AVRE was as a carrier for the Small Box Girder (SBG) bridge, which could carry a 40-ton load (the weight of a Churchill tank) over a 30-ft span. This could be laid mechanically under fire. 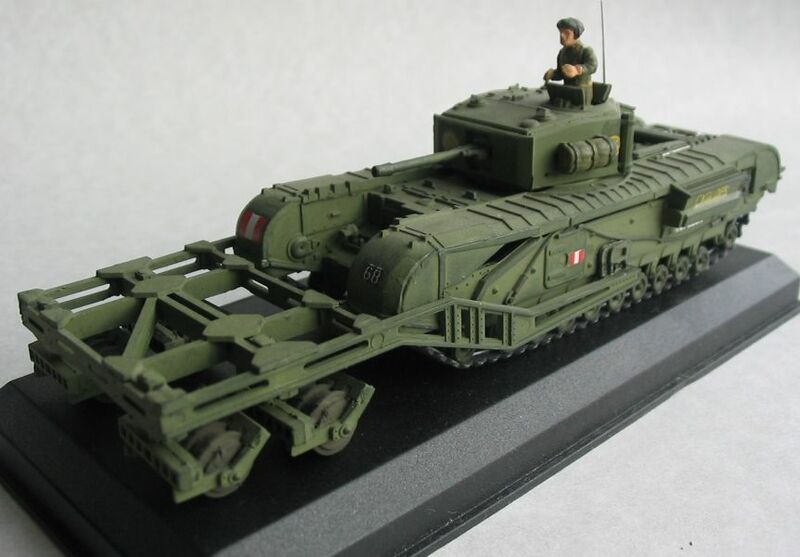 Churchill AVRE with Bobbin Mark II. The mat laid was 9ft 11 inch wide. 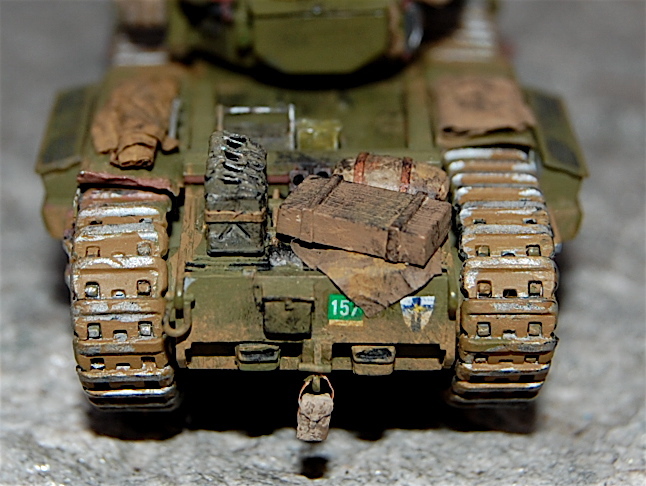 These mats were developed by 79th Armoured Division and were used during the Normandy landings. 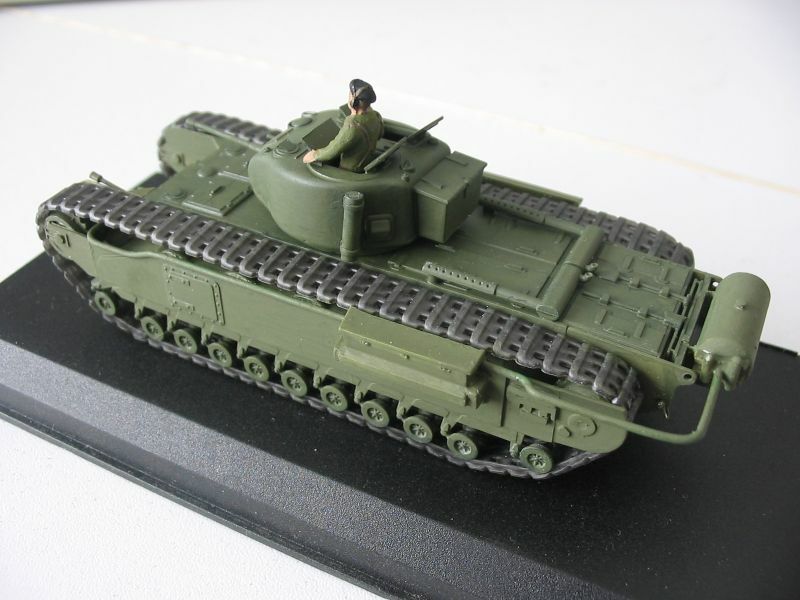 The standard wading kit for all Churchills with the later side intake. 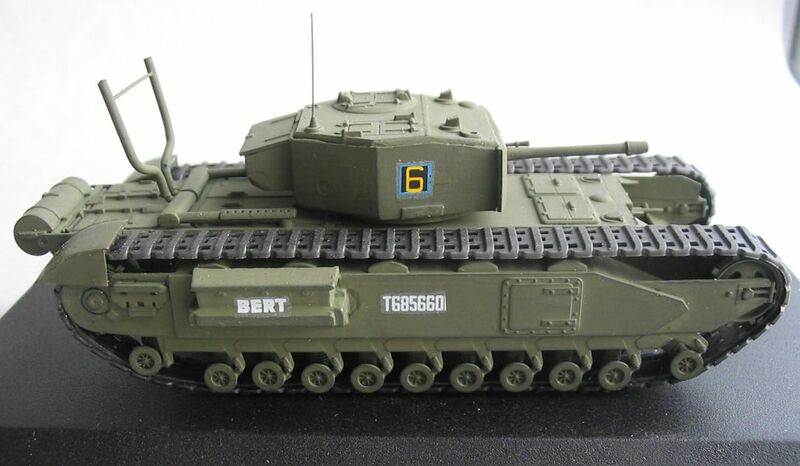 Trunking is fitted to the top of the intakes and for deep wading waterproof sealing was put round the turret base and over other openings. 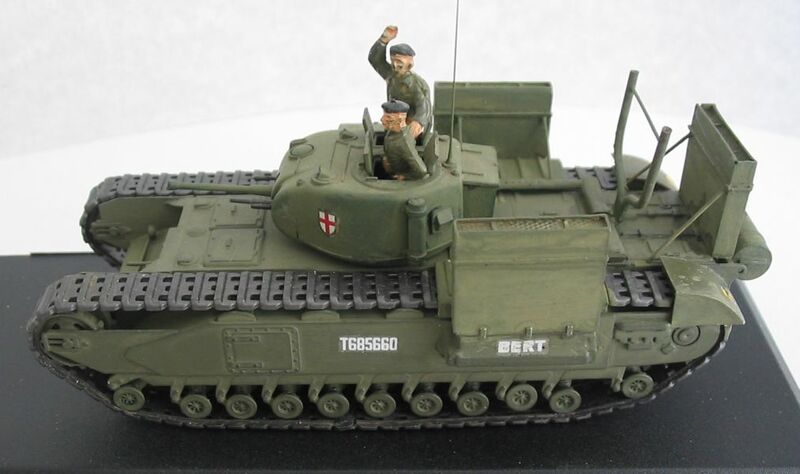 Churchill AVRE with "Farmer -Mine-Plough"
This version of the Churchill AVRE had a mine plough fitted in front. 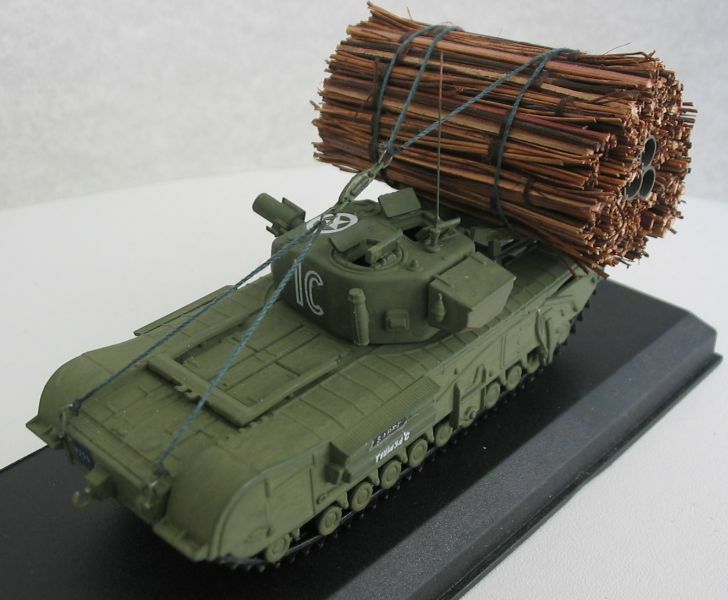 The intention was that the landmines would be brought to the surface and pushed aside. 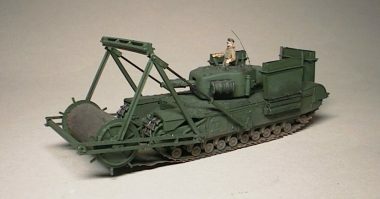 I do not know if this version was used in action, as it seems that in most mine clearing operations the Sherman Crab was used. 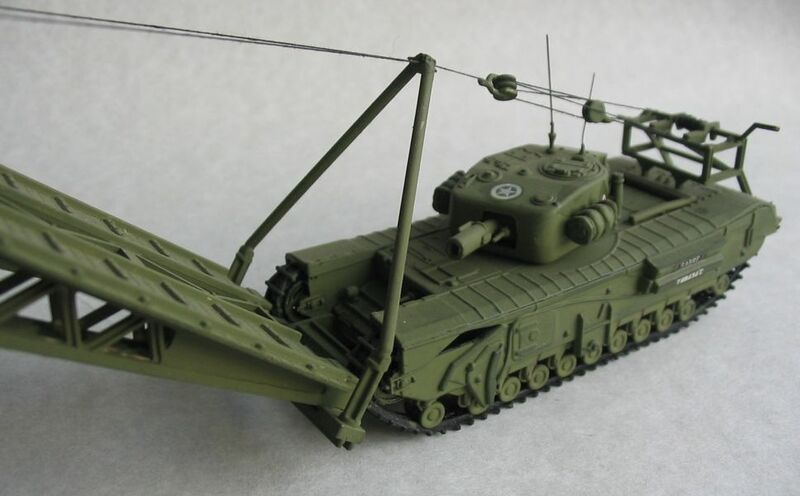 The Bridgelayer conversion was based on a Churchill MK-III or MK-IV. 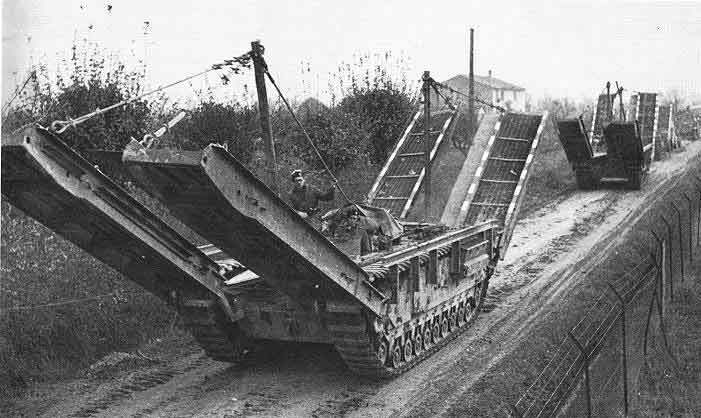 The bridge could carry a 60ft tank or Class 40 wheeled vehicles, and the driver operated the laying mechanism; the only other crew member was the commander. 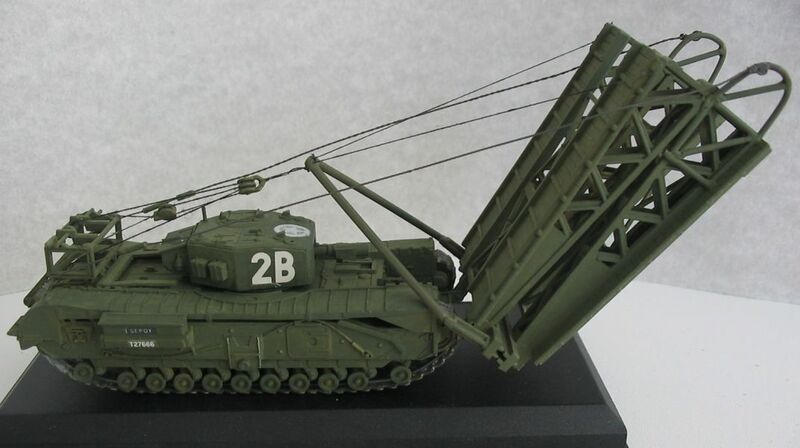 A side view of the Churchill Bridgelayer shows well the size of the bridge - which was large for its day. 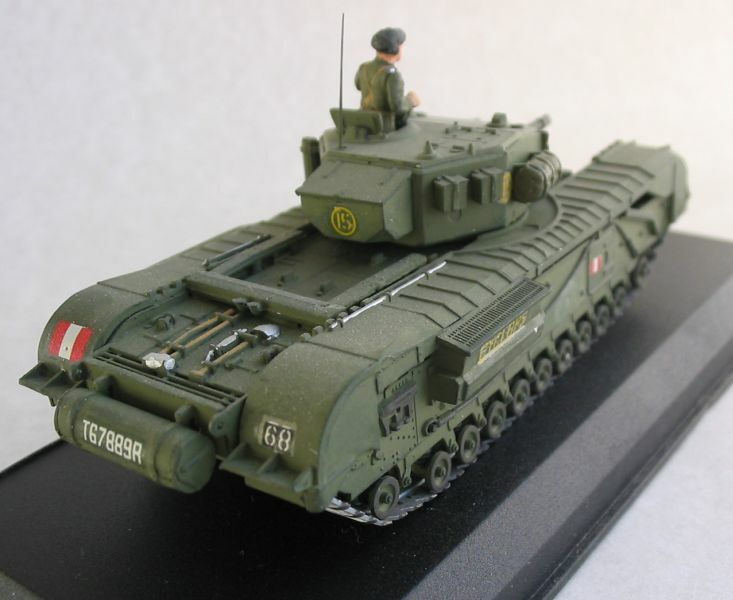 Churchill AVRE with twin Bobbins. 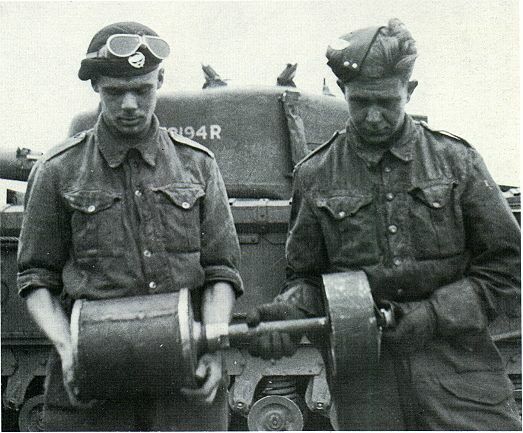 One of the various mat-laying devices were fitted to Churchill was this twin bobbin which had two small bobbins of hessian and chespaling, suitable for heavy vehicles. 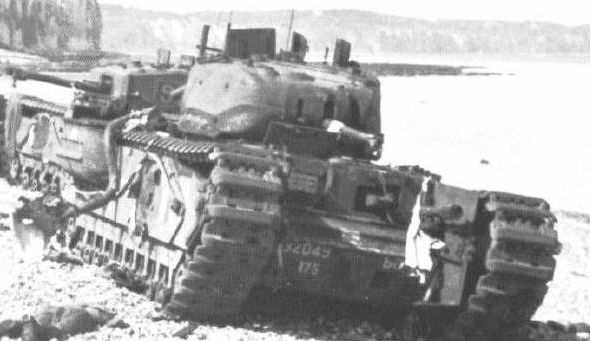 One of the major problems when landing on an open beach was getting over the seawall - this was a stumbling poit at Dieppe. 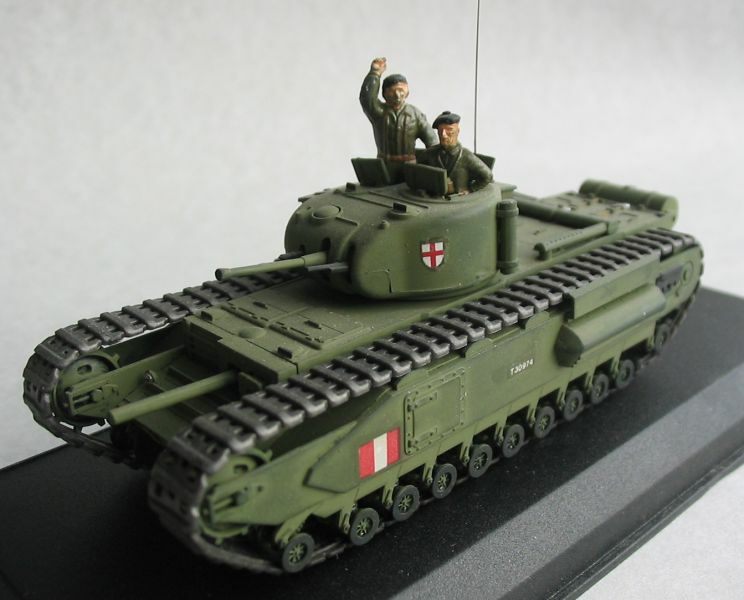 The Churchill Ark MKI was the answer to the problem. 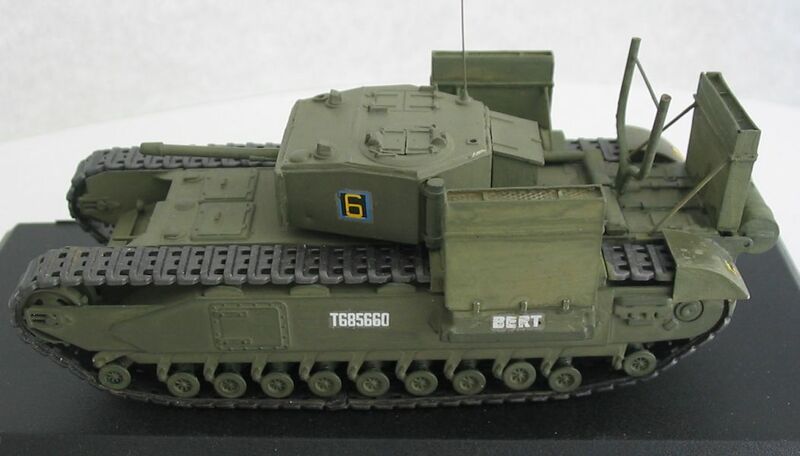 It was a turretless Churchill III or IV with trackway of metal and timber construction above the tracks and with short hingend ramps at each end. 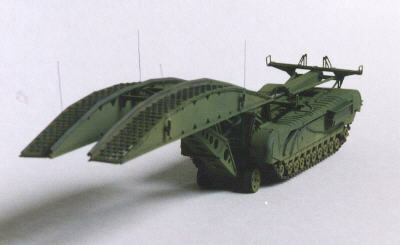 A ratched attachment under the front ramps allowed the tracks to bounce the ramps against the seawall. 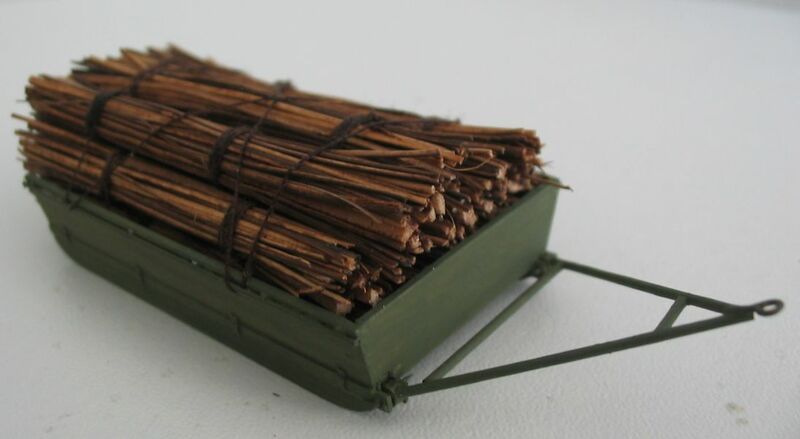 Fifty Ark I's were produced in February 1944 for use in the Normandy landing. 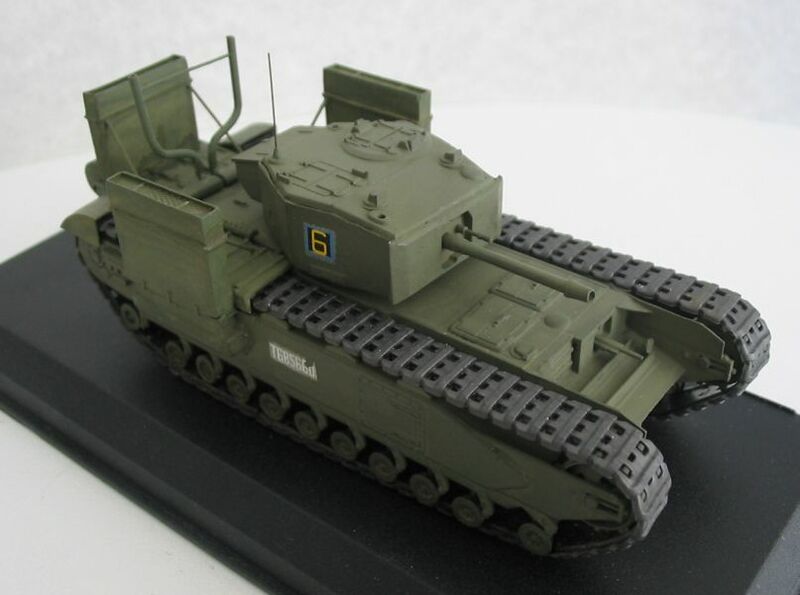 The Ark MK-II (Italian Pattern) was developed by British forces in Italy and used its own tracks as a trackway. 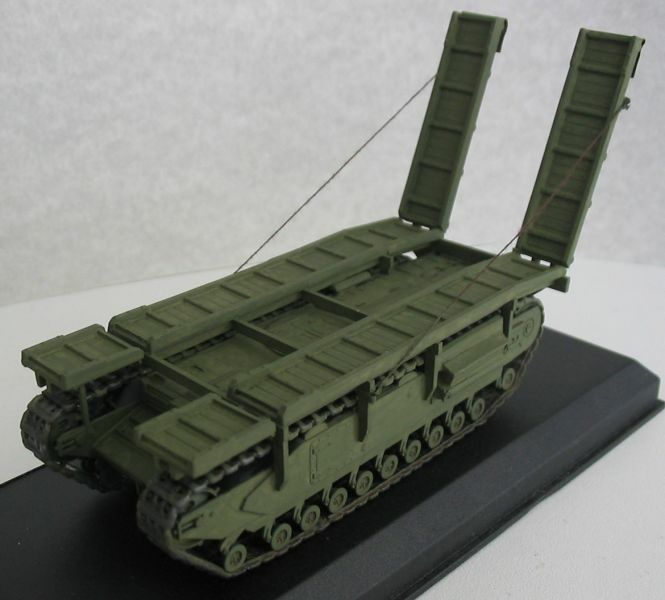 The ramps were American Treadway tracks and came in two lengths, with kingposts to hold him up ARK was an "acronym" for "Armoured Ramp Carrier". 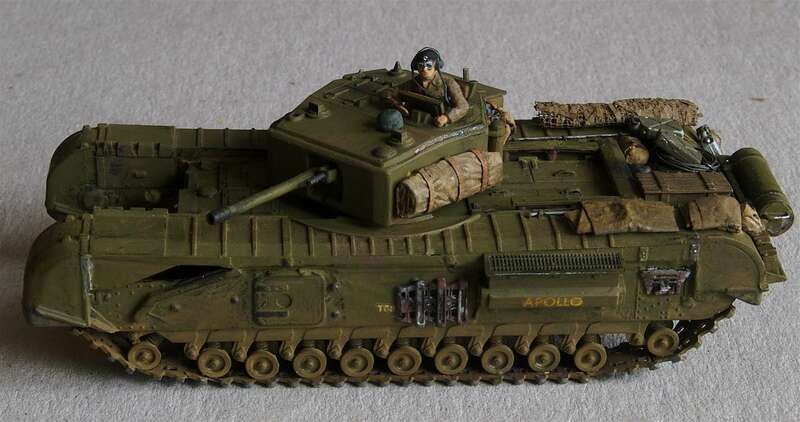 An armoured recovery vehicle conversion of the Churchill (ARV MK-I) was developed in early 1942. 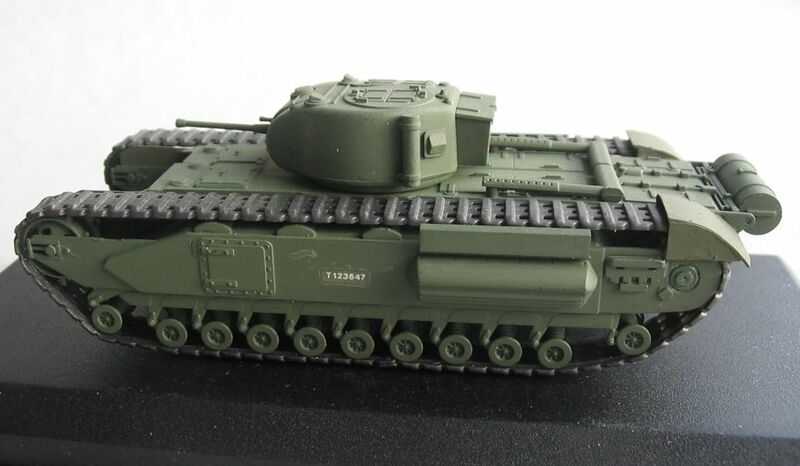 It was essentially a Churchill MK-I or MK-II with the turret and armament removed. 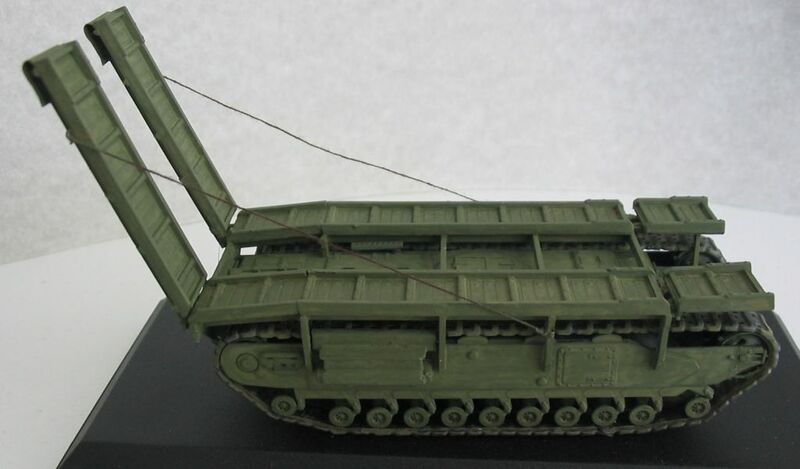 It had a rear drawbar for towing, and a jib which was normally carried stowed on the hull. 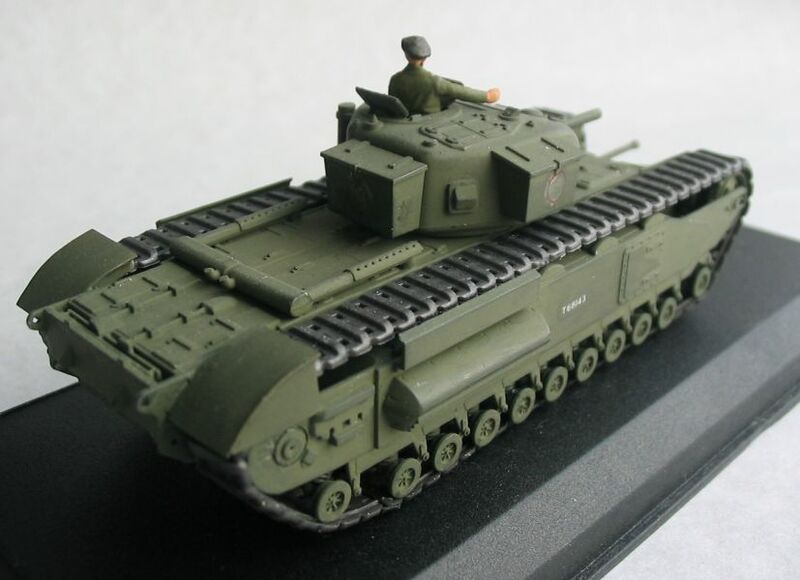 The Churchill ARV MK-II was more lavishly equipped. 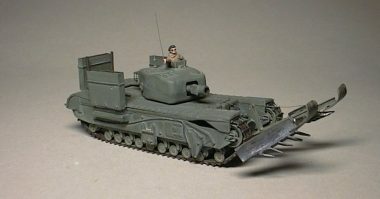 Converted from the Churchill MK-IV, it had fixed turret-like structure with a dummy gun, a fixed rear jib of 15tons capacity, a winch, a dismountable forward or rear jib, and a spade-like earth anchor. 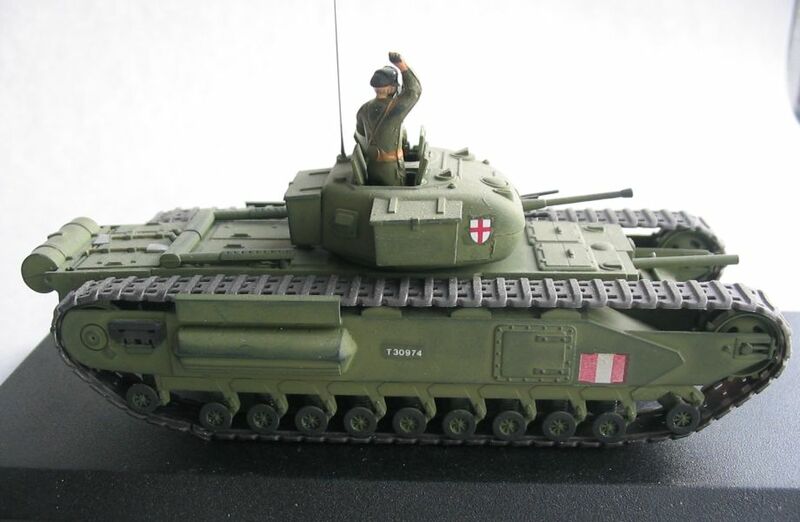 The Carrier Churchill, 3-inch Gun, MK-I was an attempt to put a high-velocity gun on tank chassis to give fire power to match the German 88mm gun. 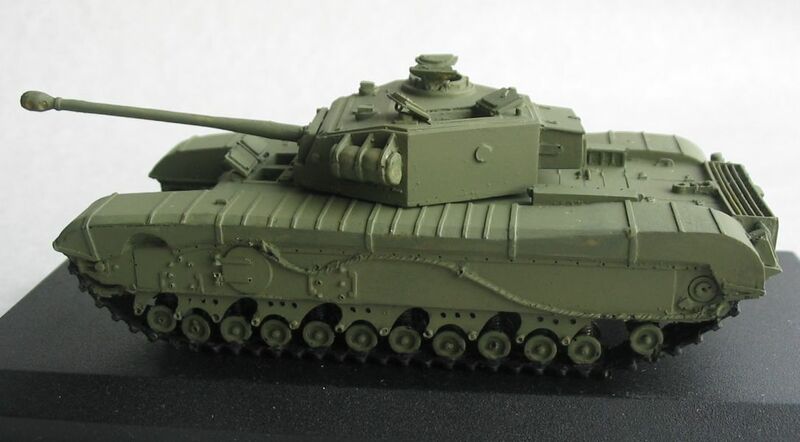 No British tank was big enough to take a gun heavier than the 6 pdr, and it was therefore decided to fit a gun in a limited traverse mount in the hull of a Churchill tank. 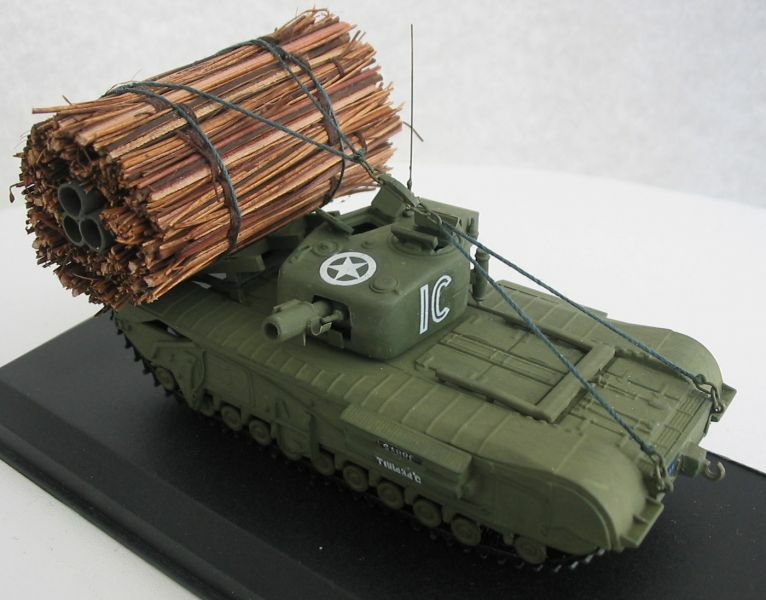 Surplus 3 inch (12.5 pdr) AA guns were adapted for the purpose, and the project for 50 vehicles was initiated in September 1941. 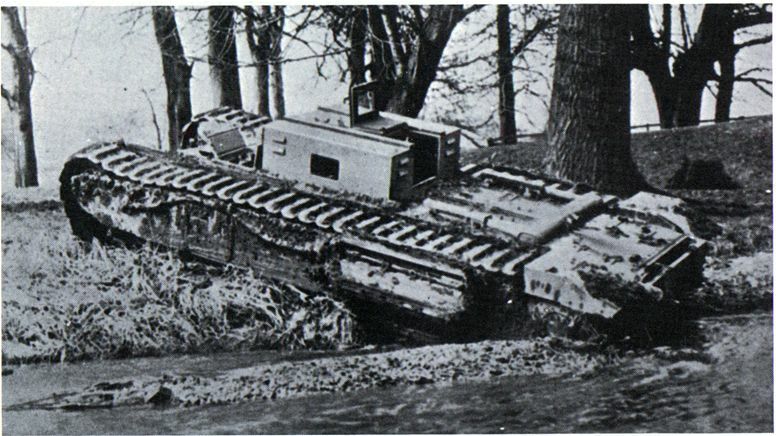 The pilot model being ready in February 1942. 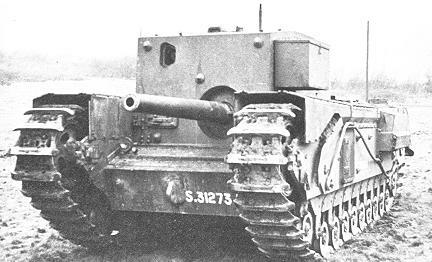 Trials were successful, but these vehicles never saw combat: by 1943 the Challenger 17pdr gun tank was in development and was thought to a better alternative. 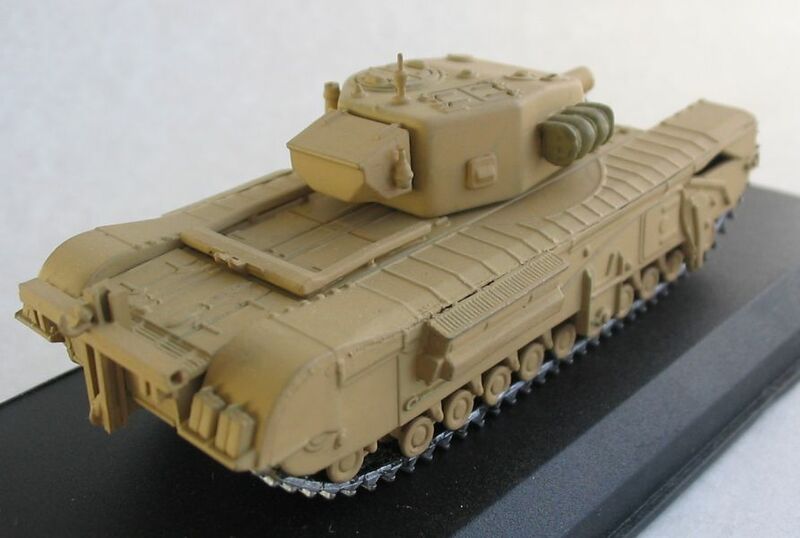 The use of the Churchill 3inch Gun Carrier was delayed because of indecision about its mode of employment and whether it was a tank or a self-propelled gun. 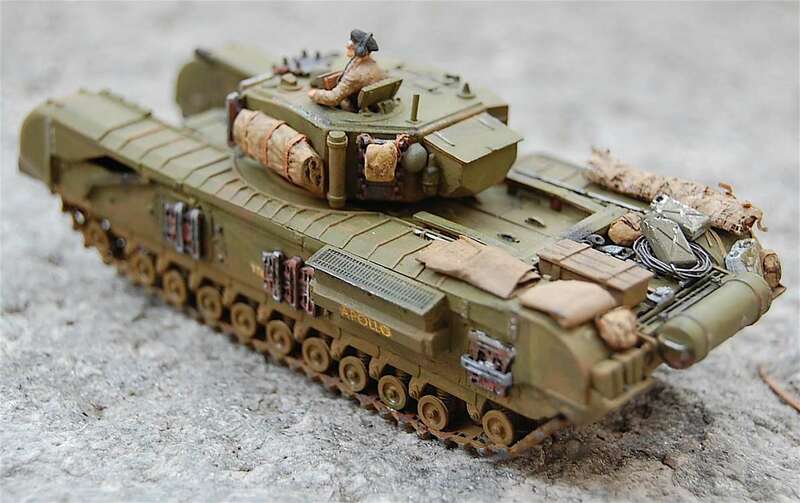 Some were converted in 1943-44 to carry Snake mine clearing equipment, but these vehicles (which had the gun removed) were used only for trials. 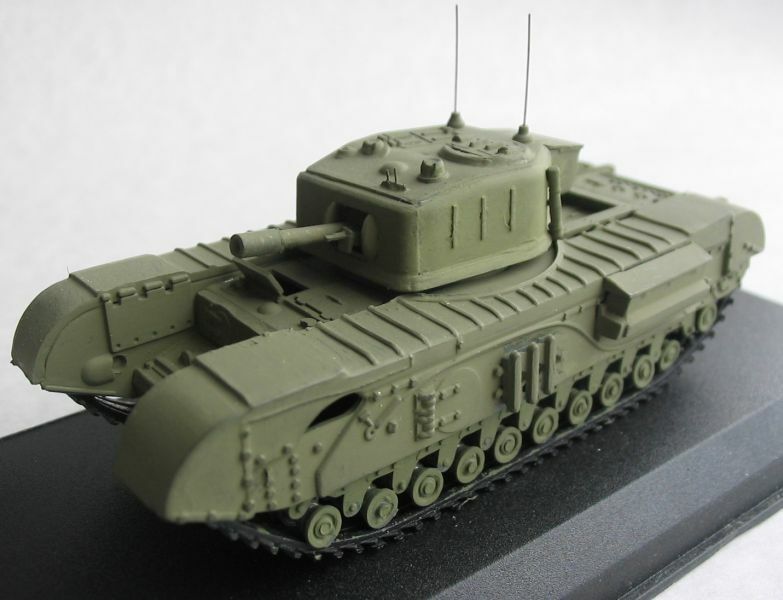 Churchill with Jones Onion. 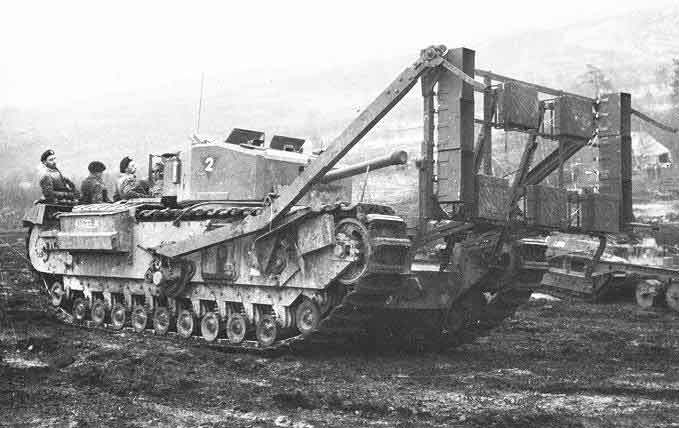 One of a number of charge placing devices mounted on Churchill to breach or demolish obstacles. 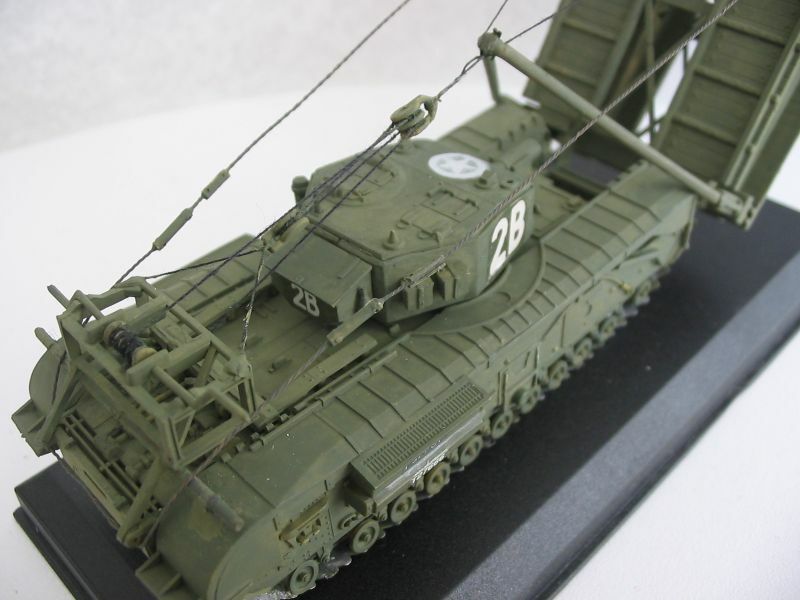 1,000 lb HE charges were fixed to a frame attached to the front and kept upright by two arms. On reaching the obstacle, the frame was released and a pair of legs at the bottom of the frame met the ground first and made sure that it fell forwards and not back against the tank!. 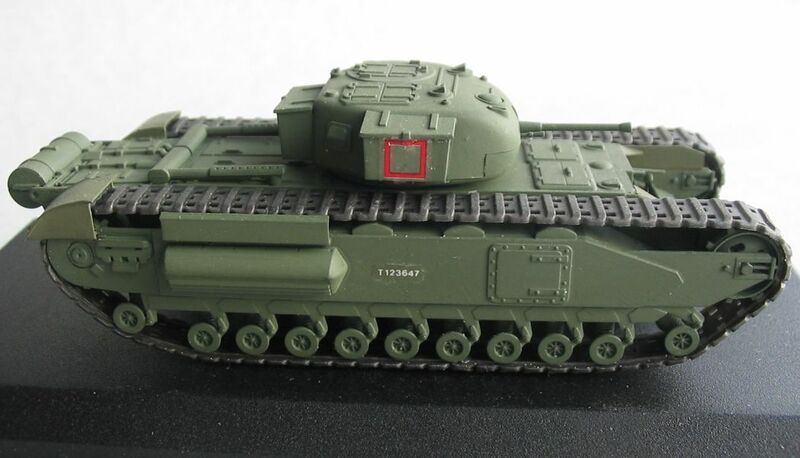 The tank reversed away. The explosives were set-off remotely. 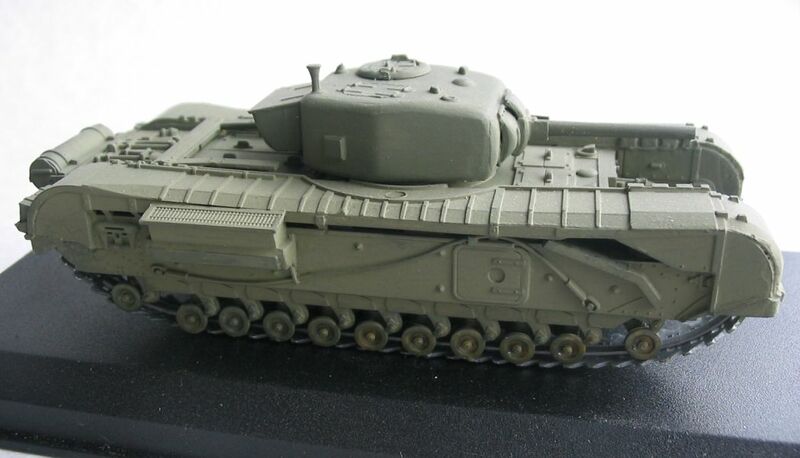 Basically a Churchill MK-VII, but with a wider hull and larger turret containing a 17-pdr gun. 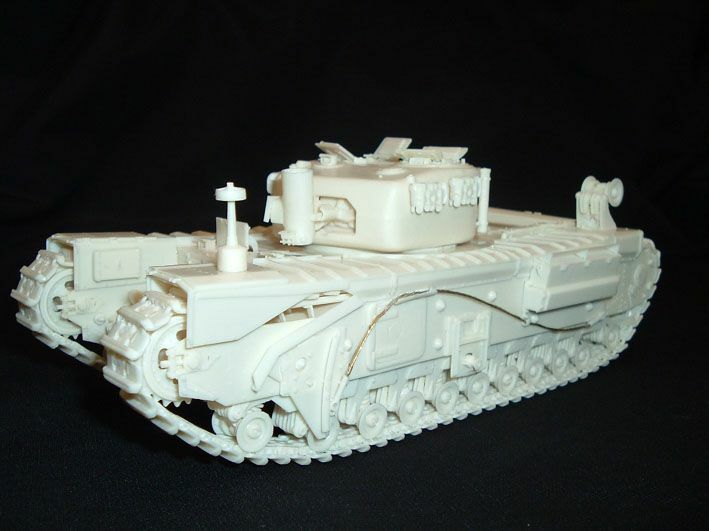 Trials prototypes were delivered in May 1945, too late for European war. 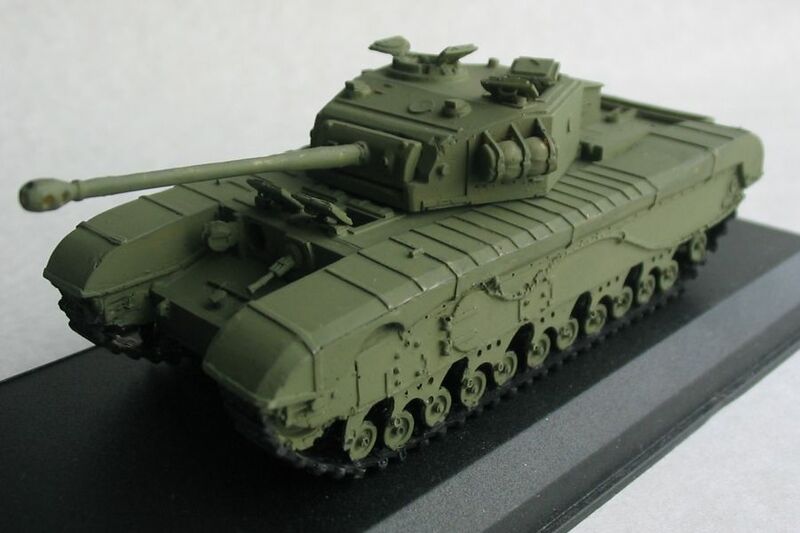 No production order followed testing as the A41 Centurion was a much better tank. 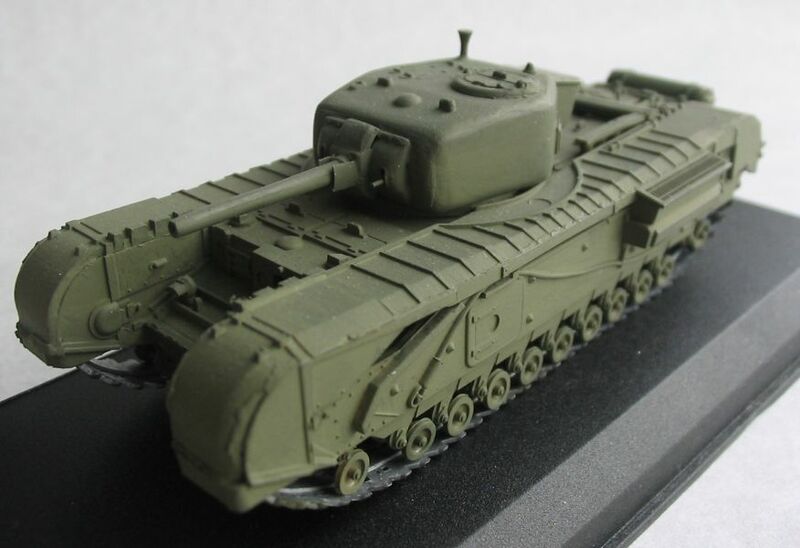 Known originally as "Super Churchill", it weighed 50 tons had a crew of five and 6 inch thick armour on the turret front but was under powered, only managing a top road speed of 10.5 mph. 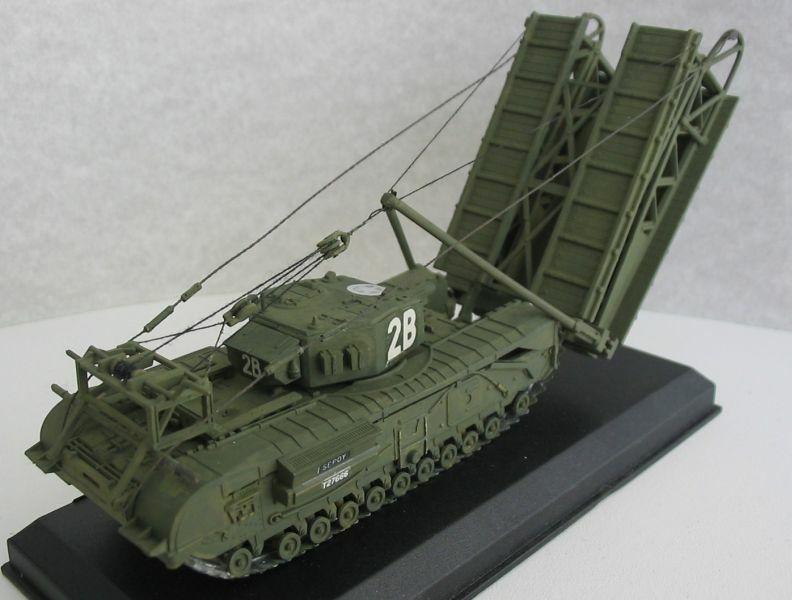 I ask the visitors of my homepage for help by completing this page with photo's from built models. Please send me by E-mail photo's from models not showed or showed with a original photo or a drawing.